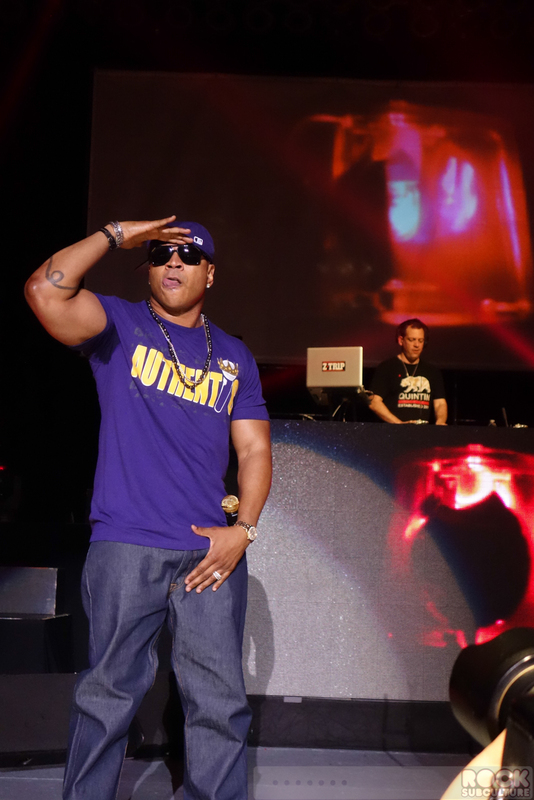 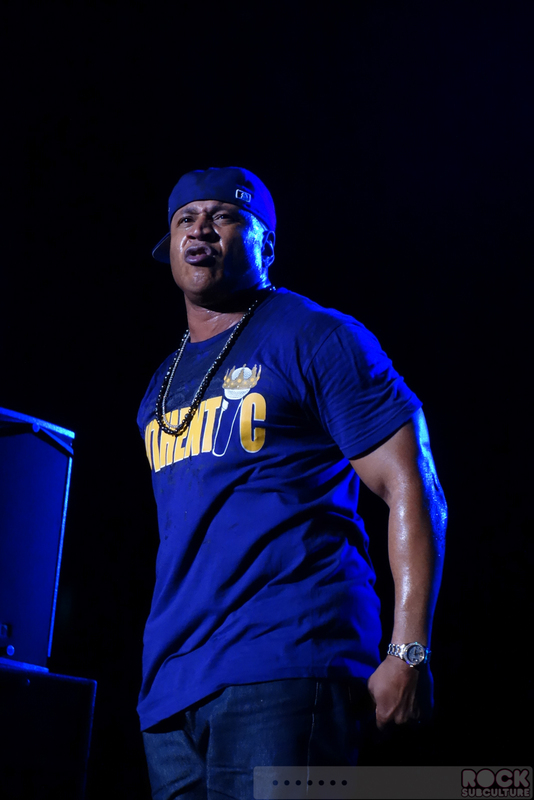 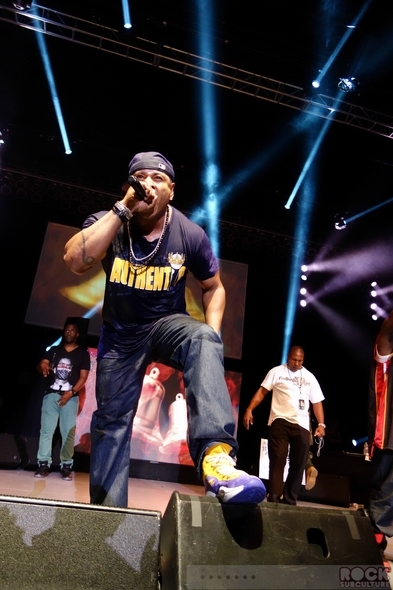 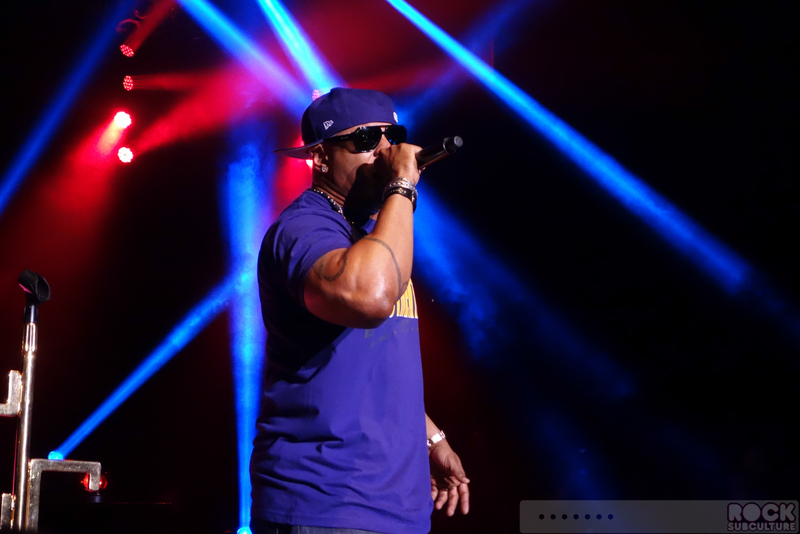 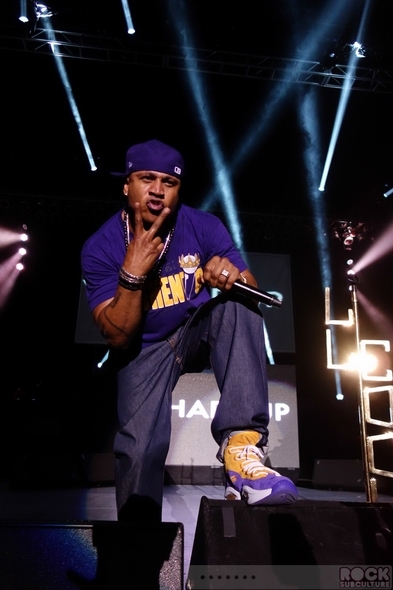 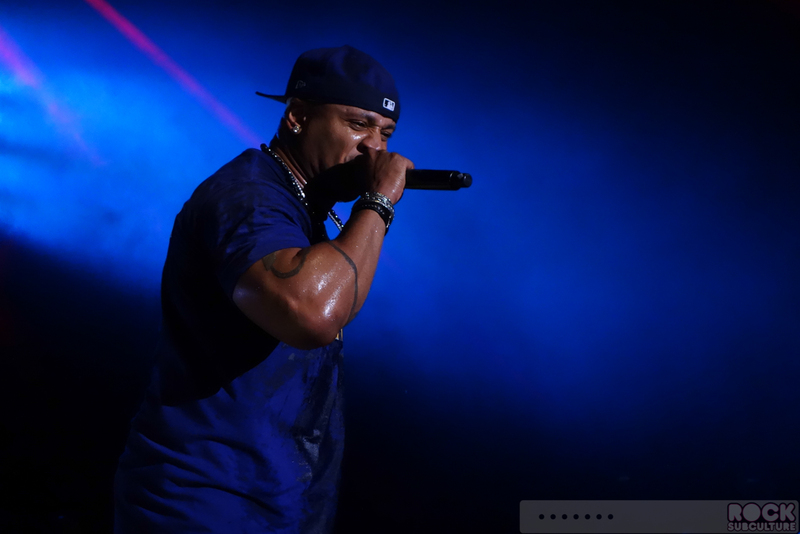 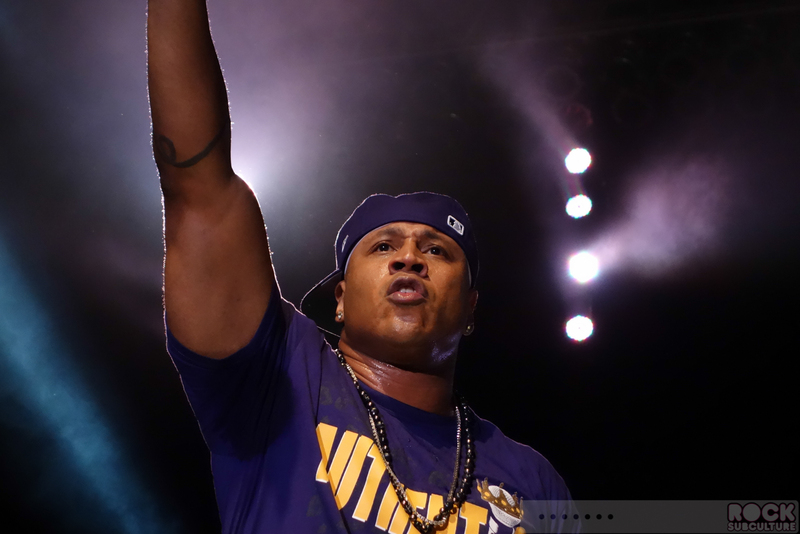 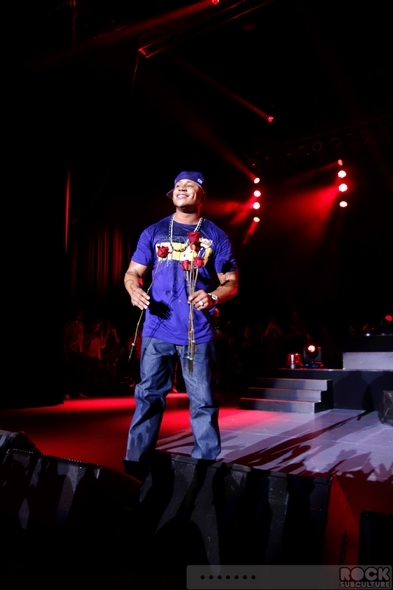 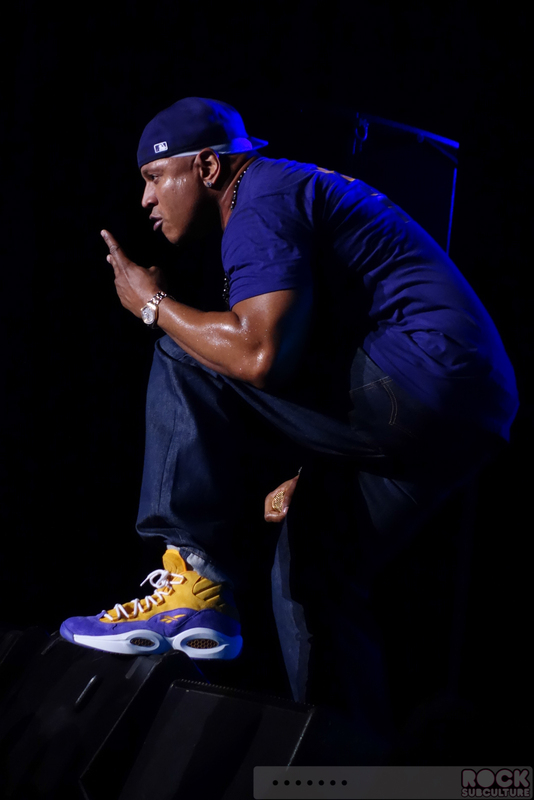 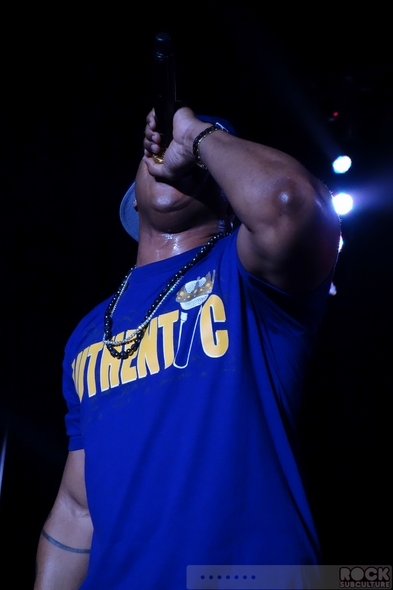 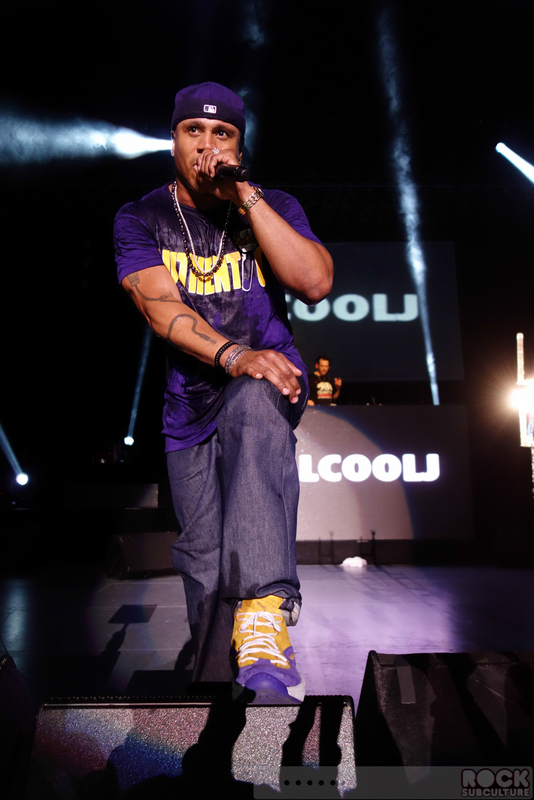 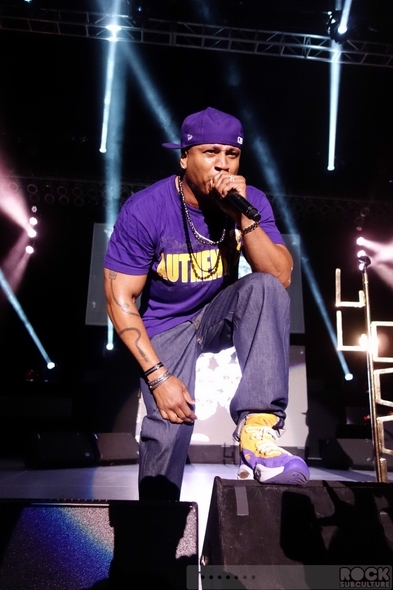 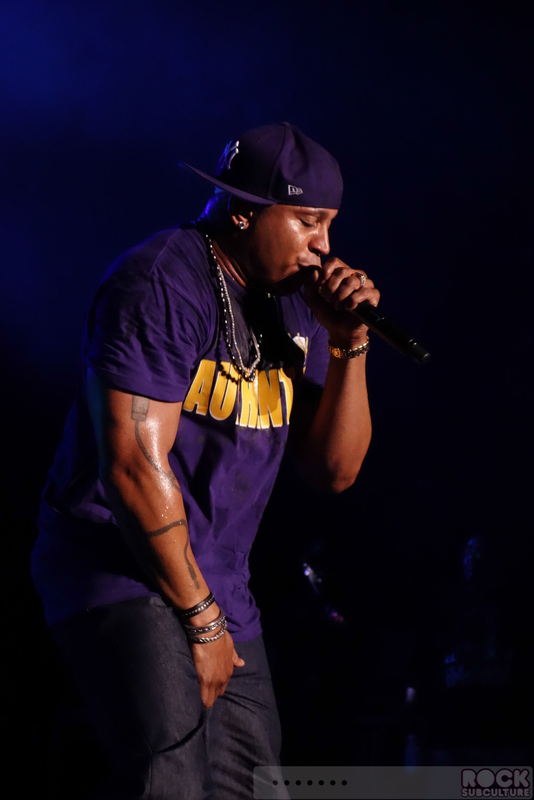 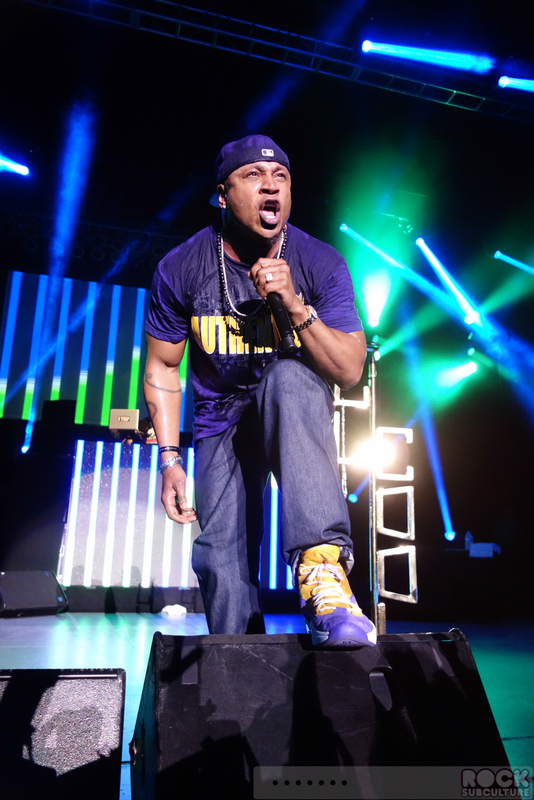 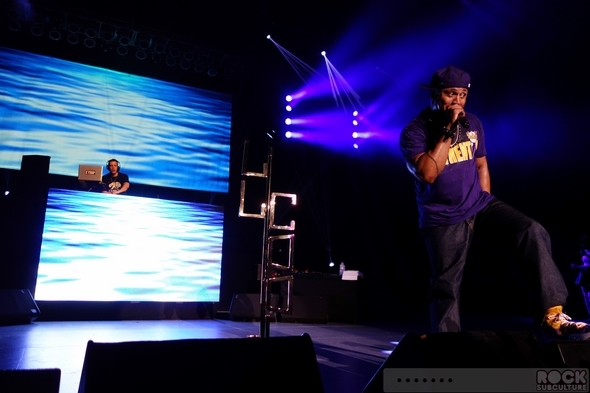 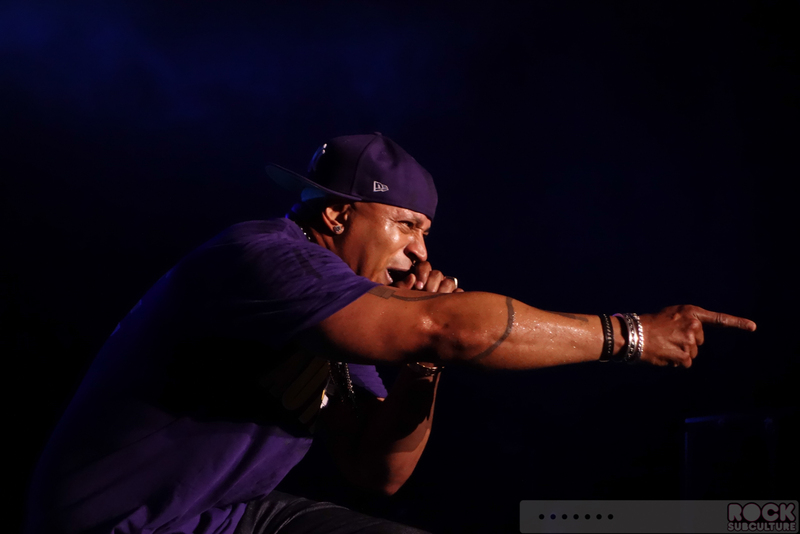 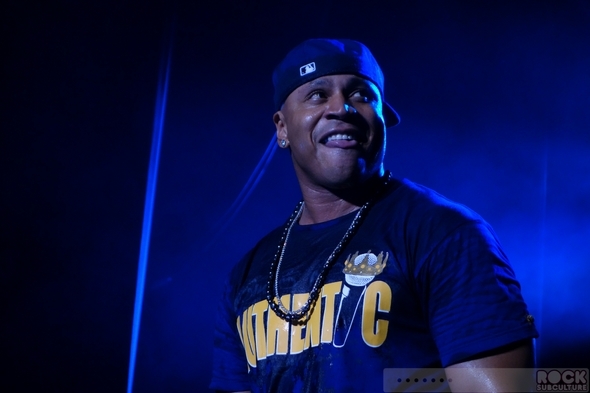 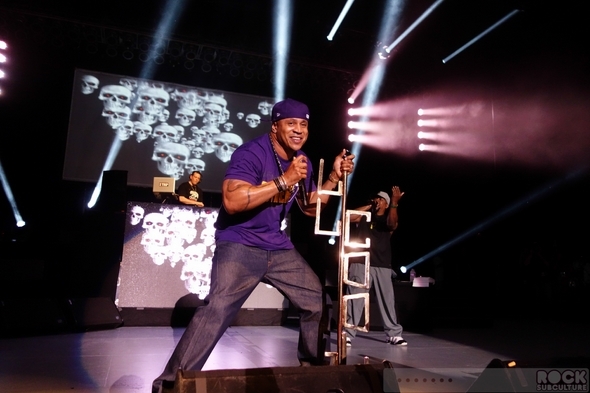 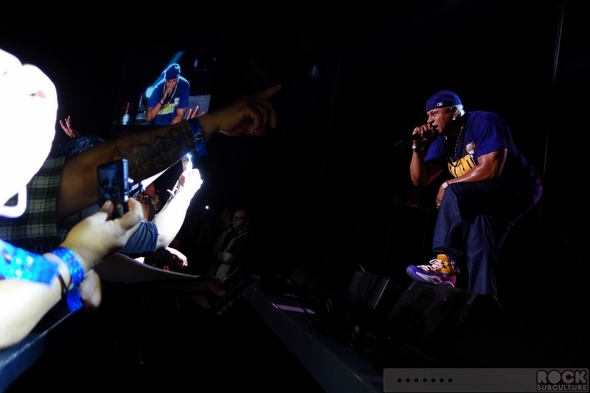 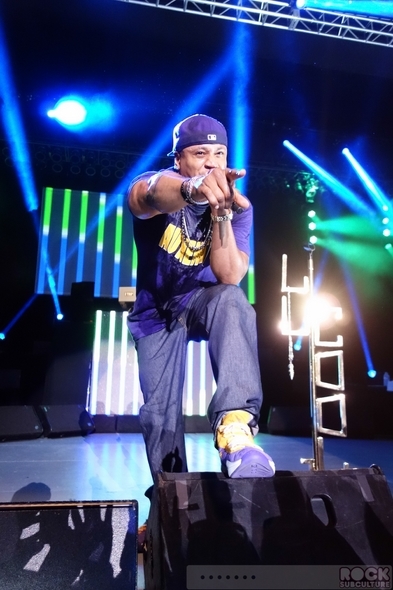 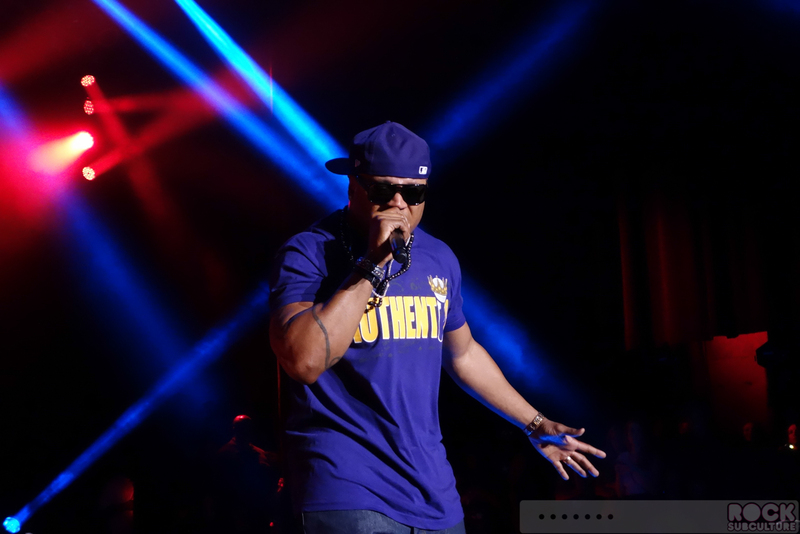 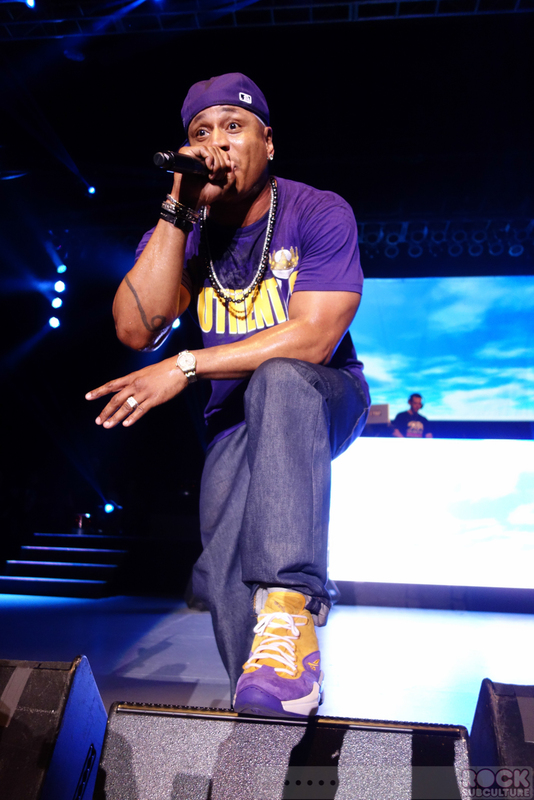 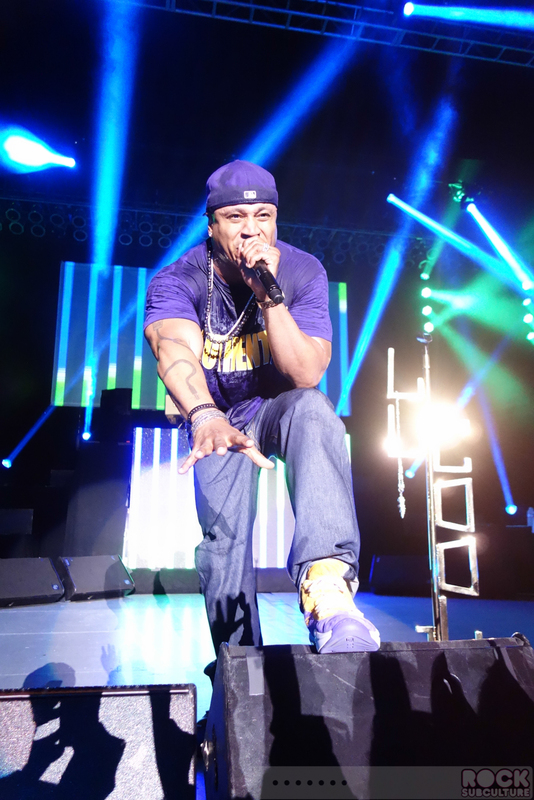 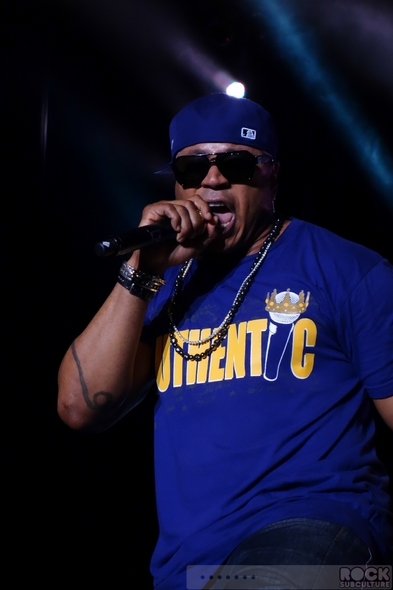 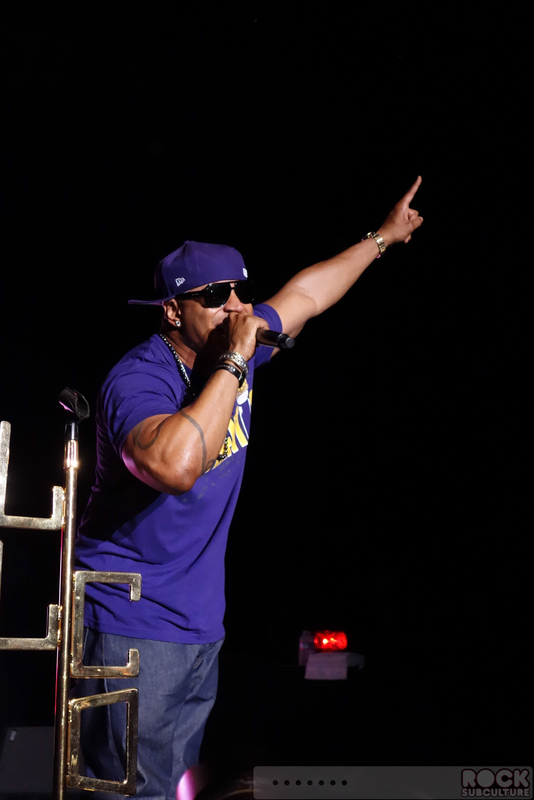 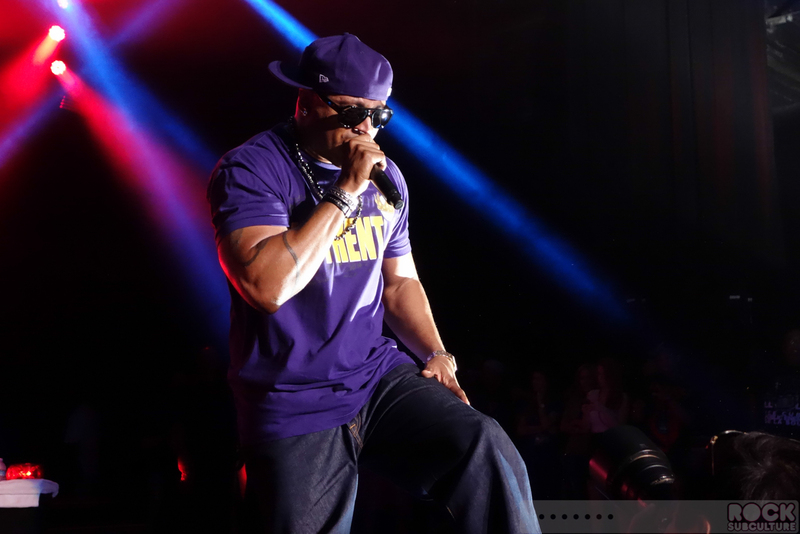 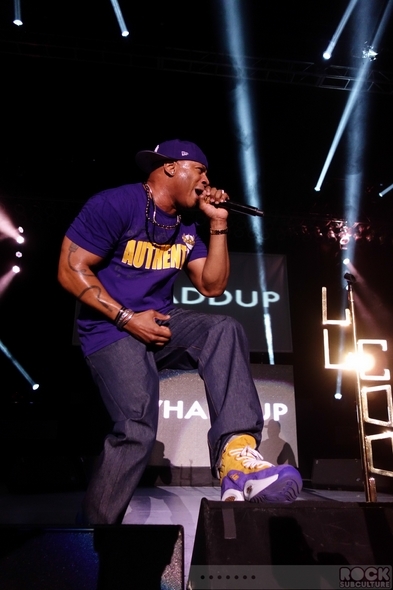 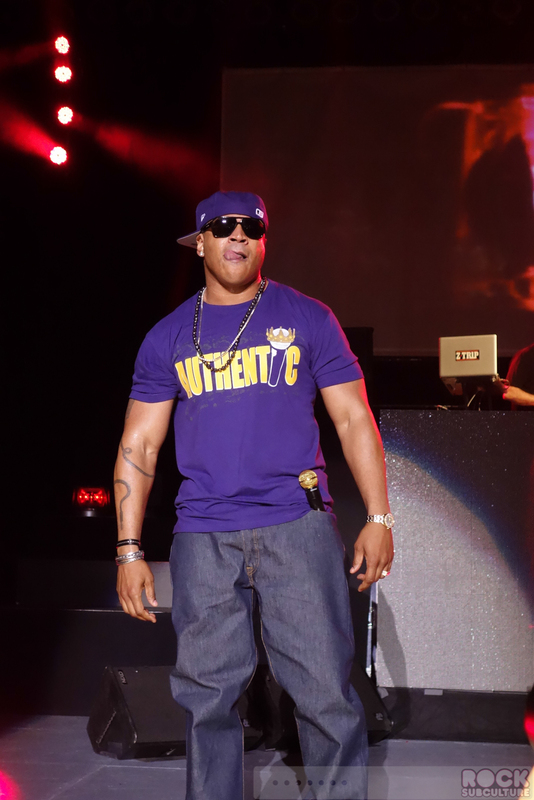 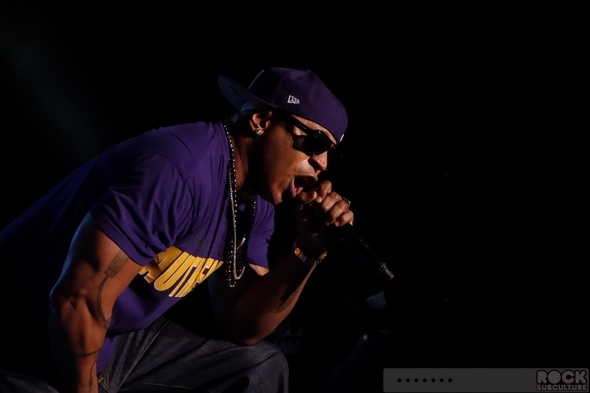 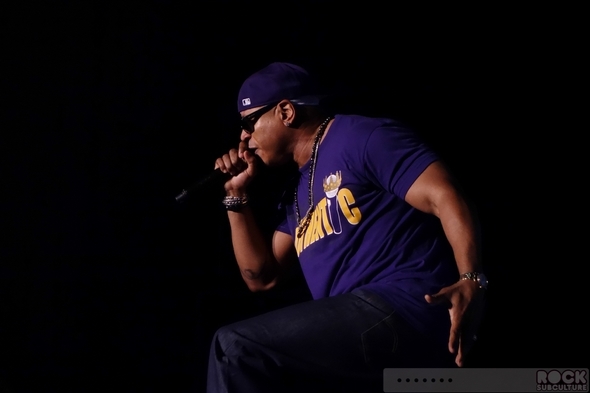 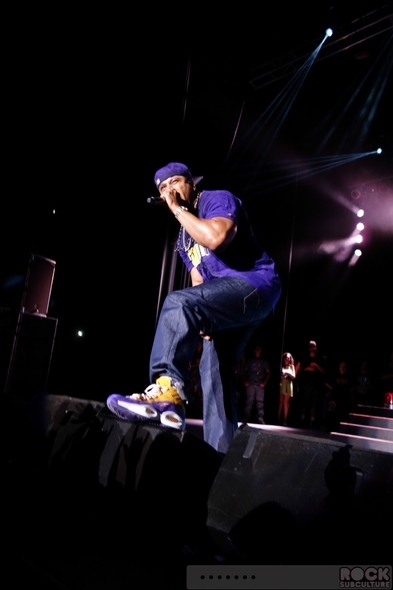 Two-time Grammy®-winning recording artist, LL COOL J featuring DJ Z-Trip, will headline the “Kings Of The Mic” Tour, which will prove to be this summer’s ultimate Hip-Hop music experience. 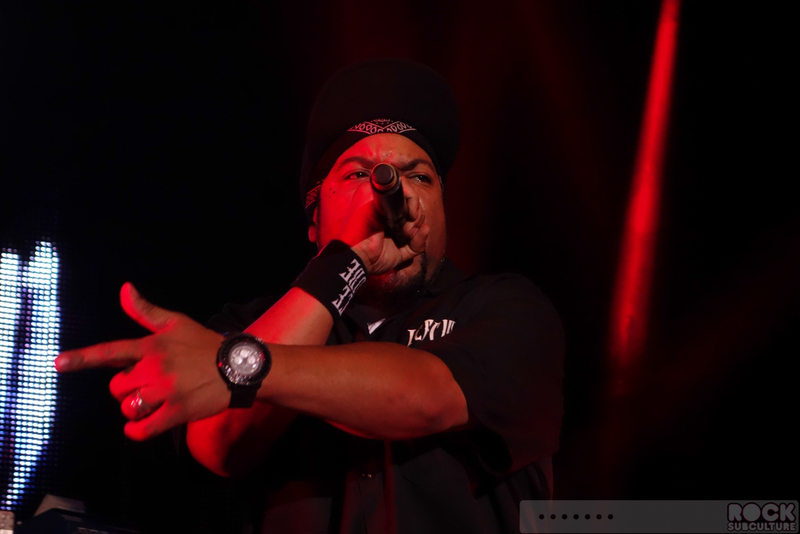 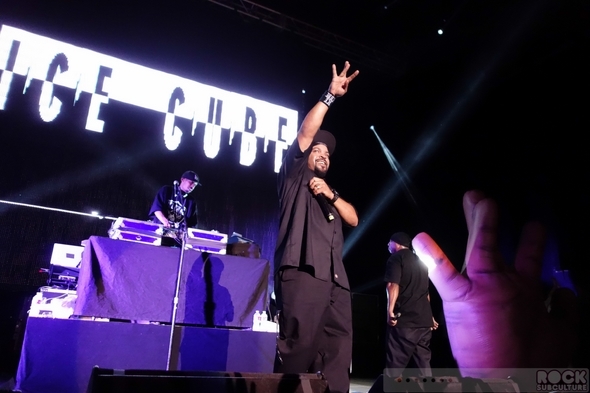 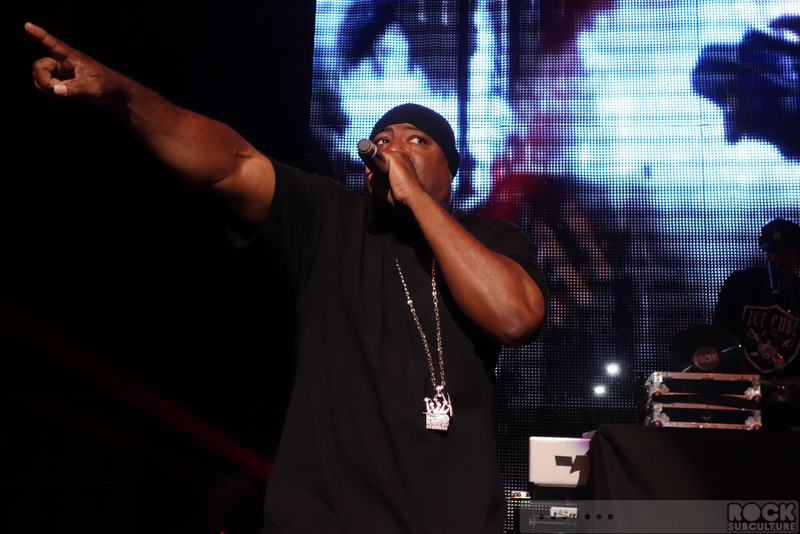 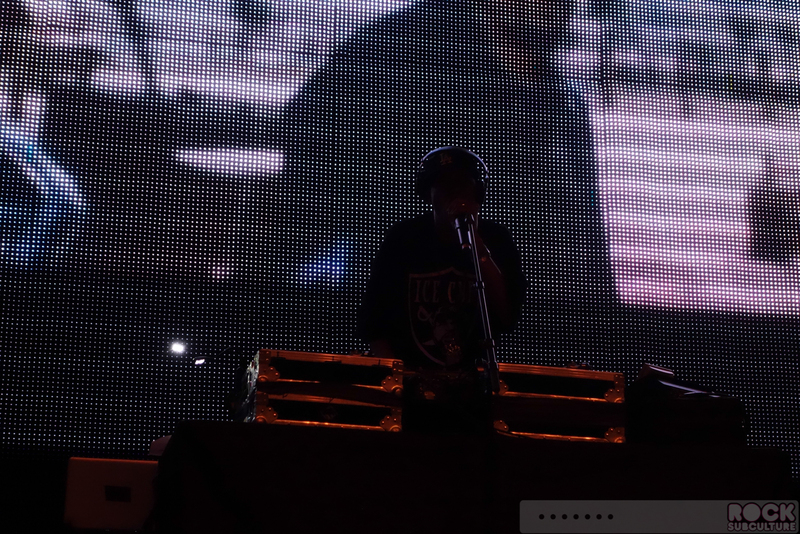 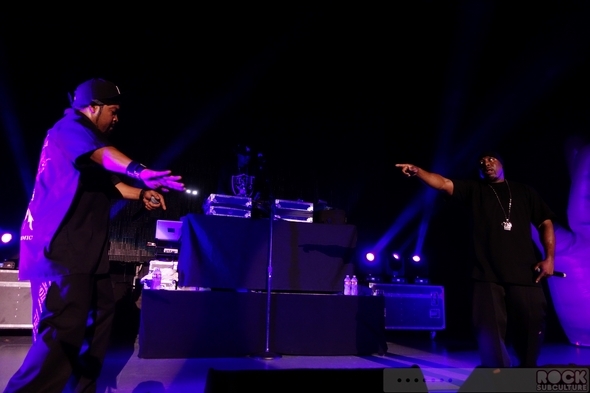 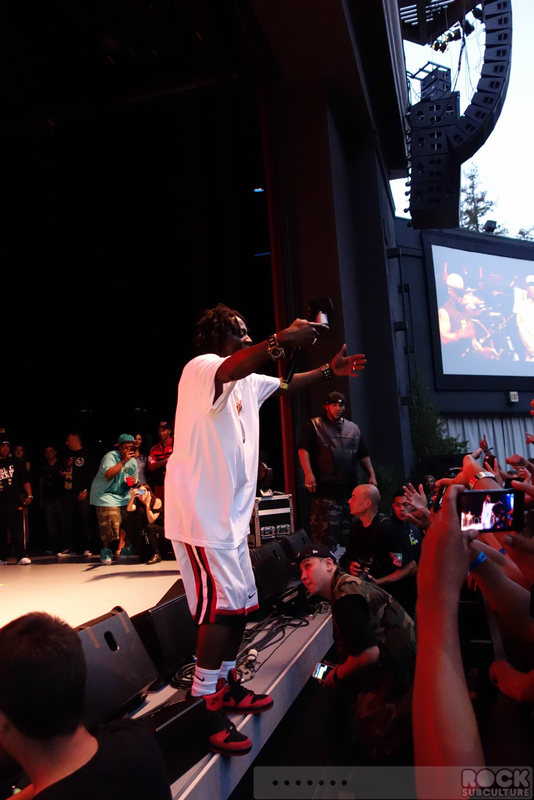 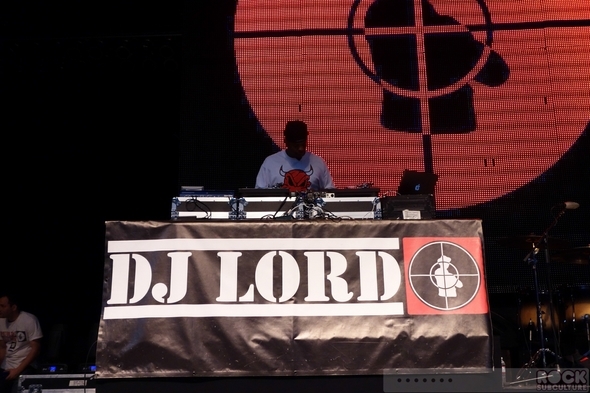 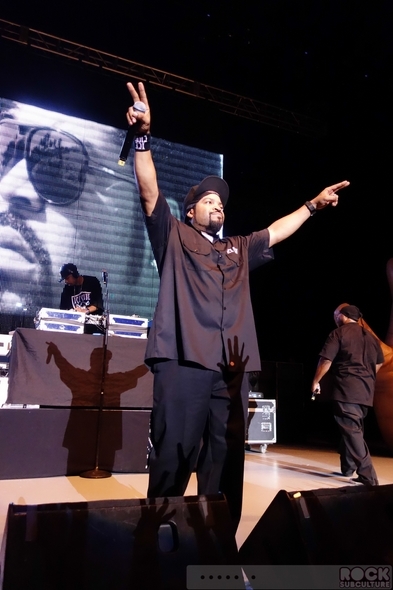 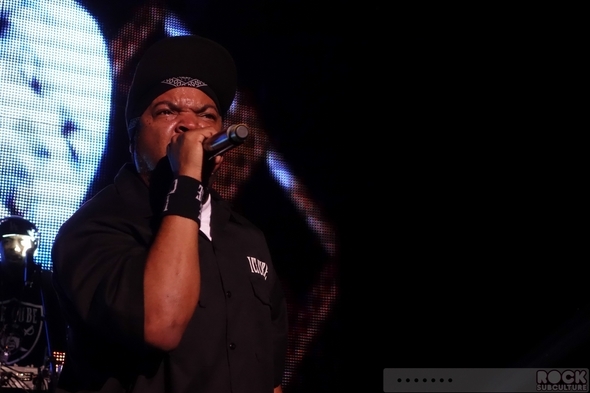 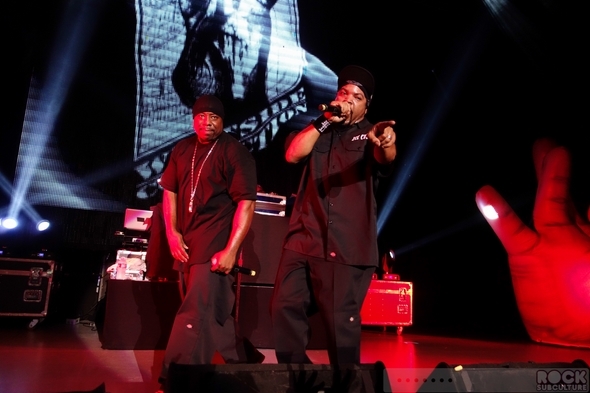 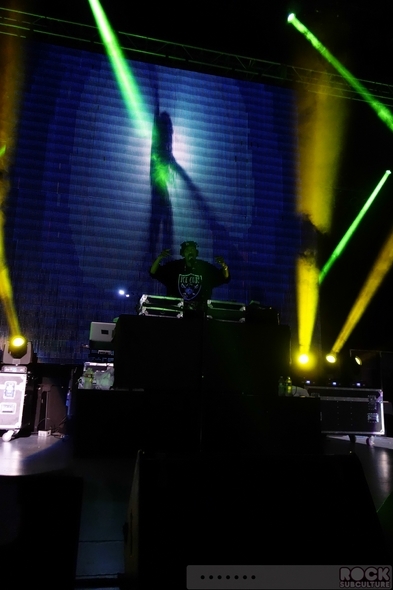 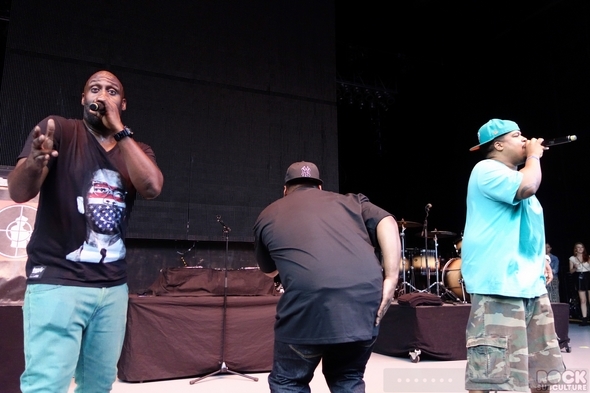 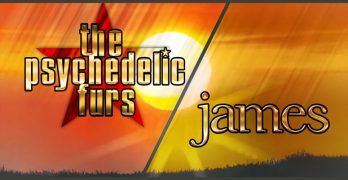 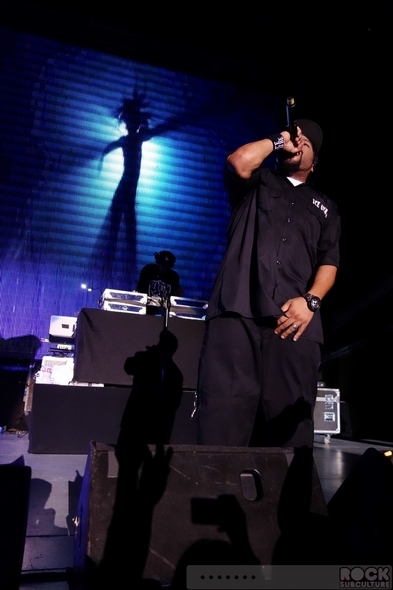 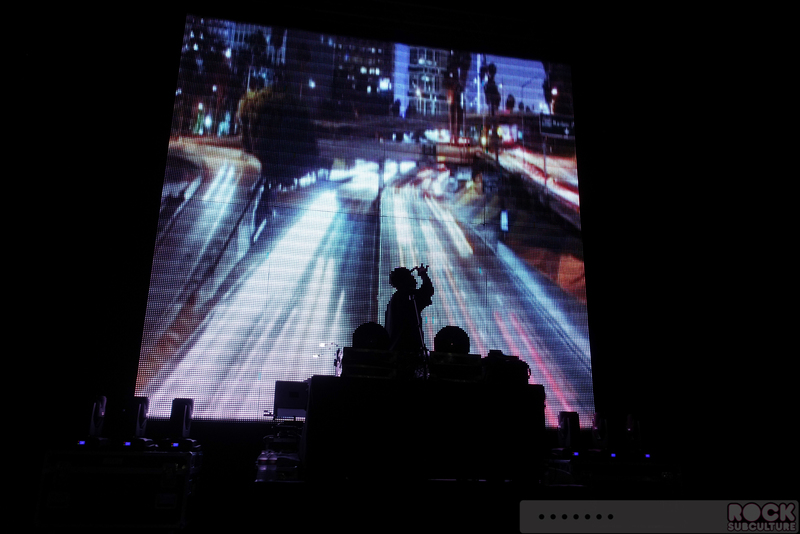 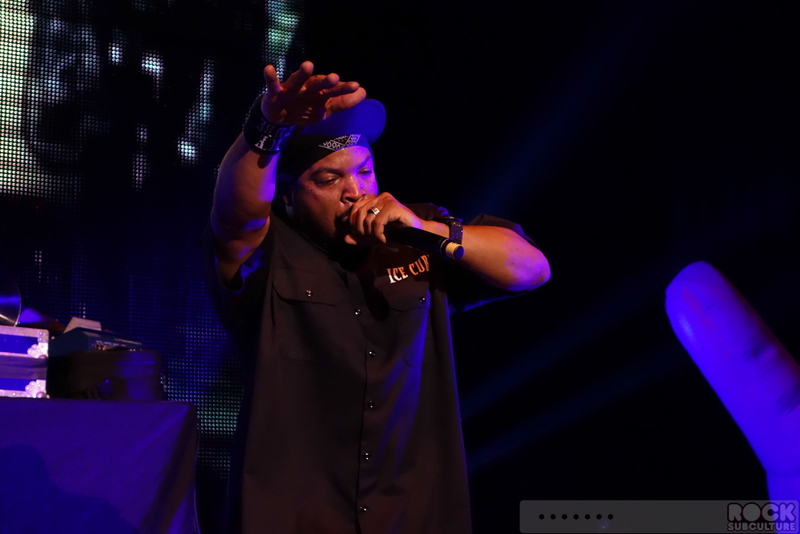 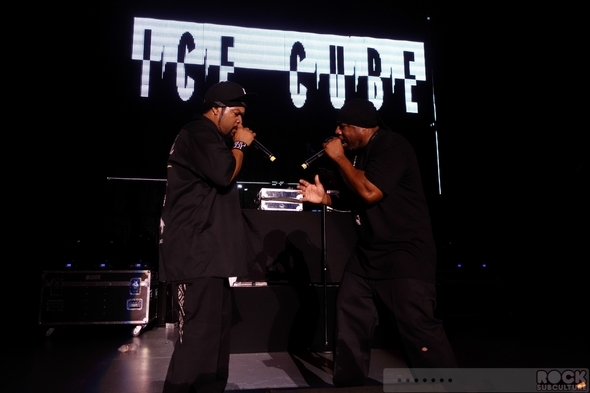 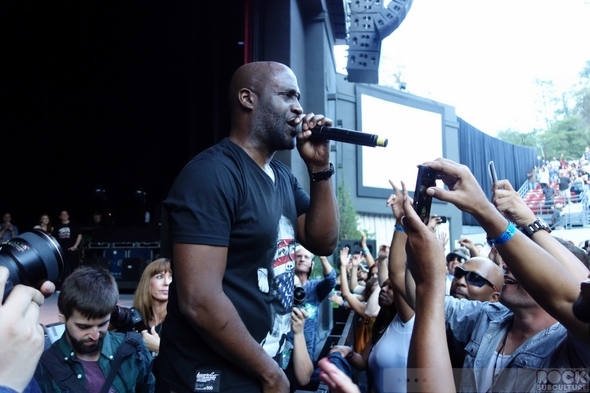 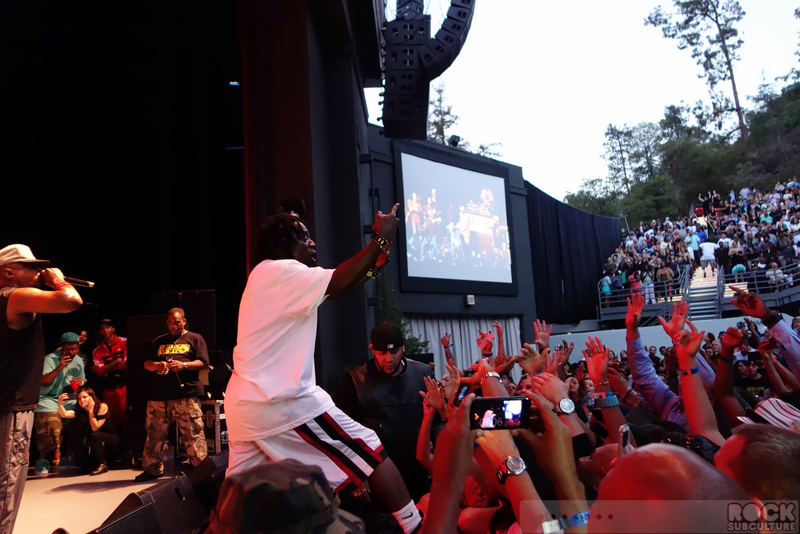 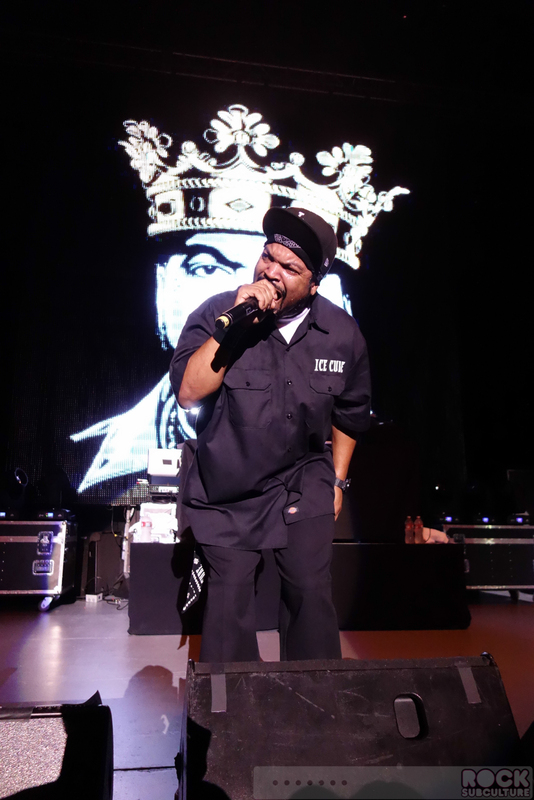 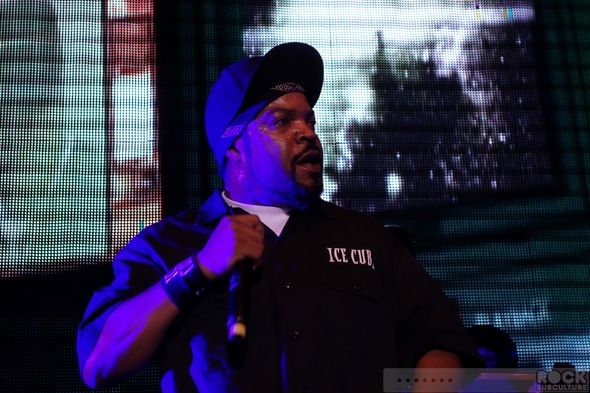 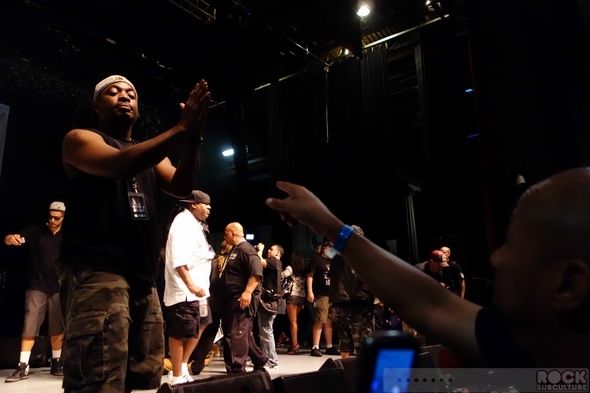 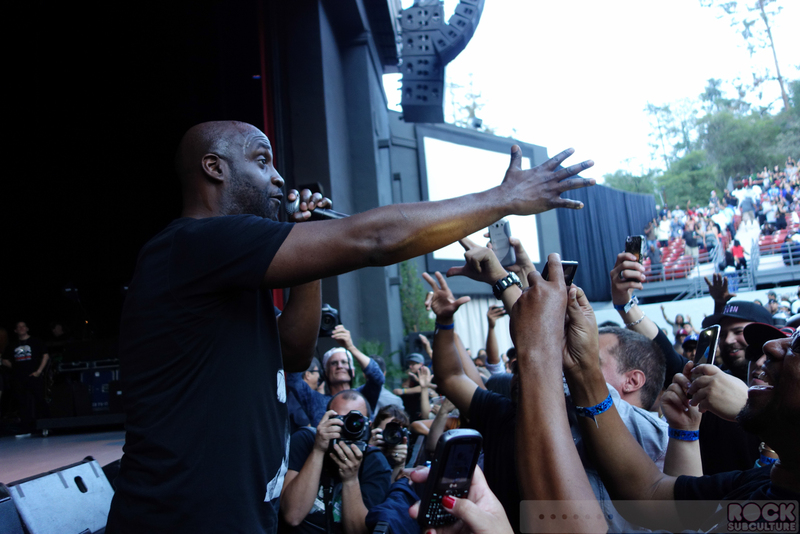 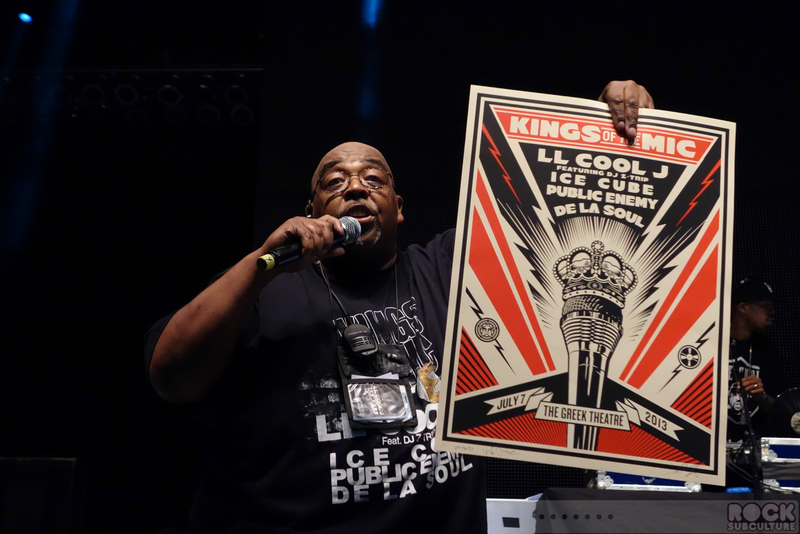 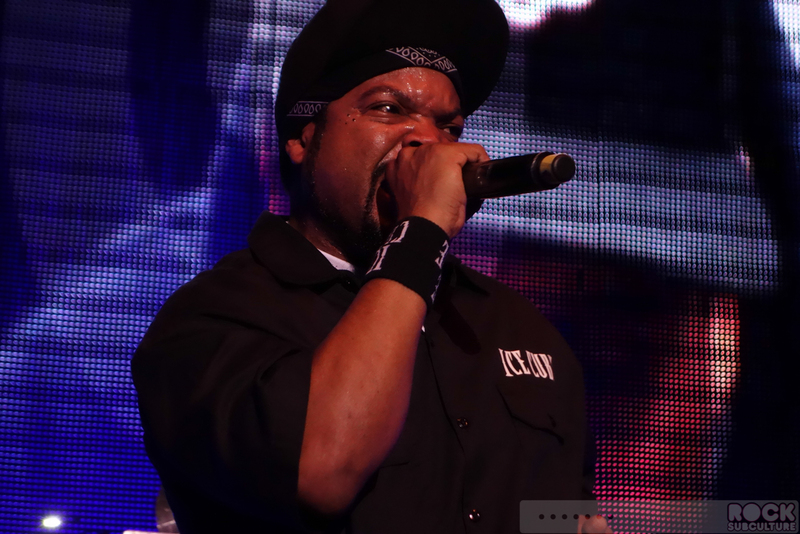 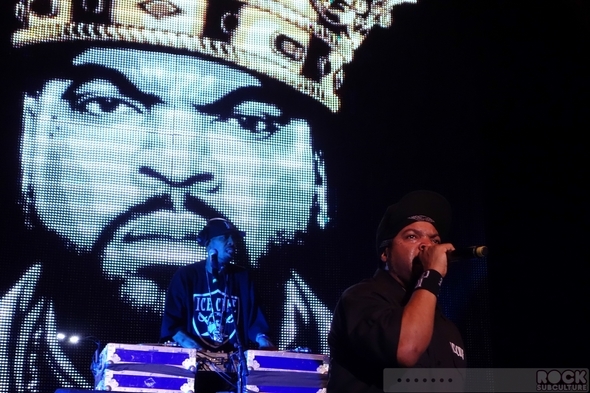 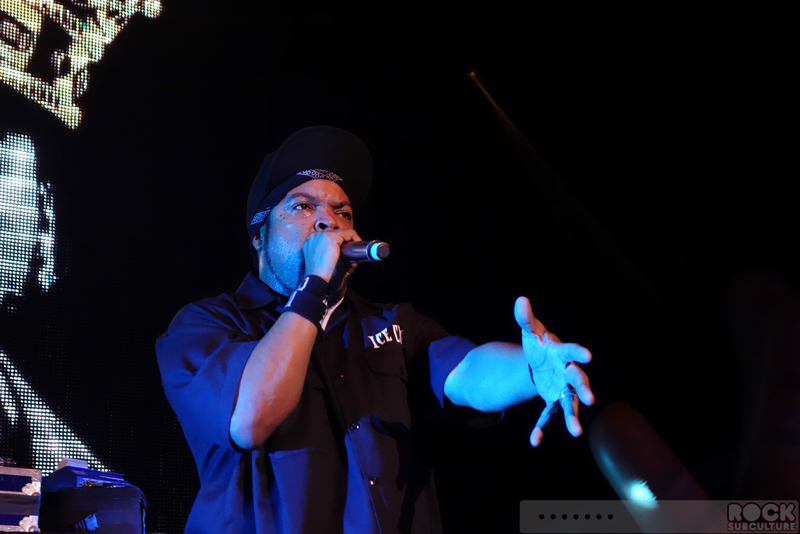 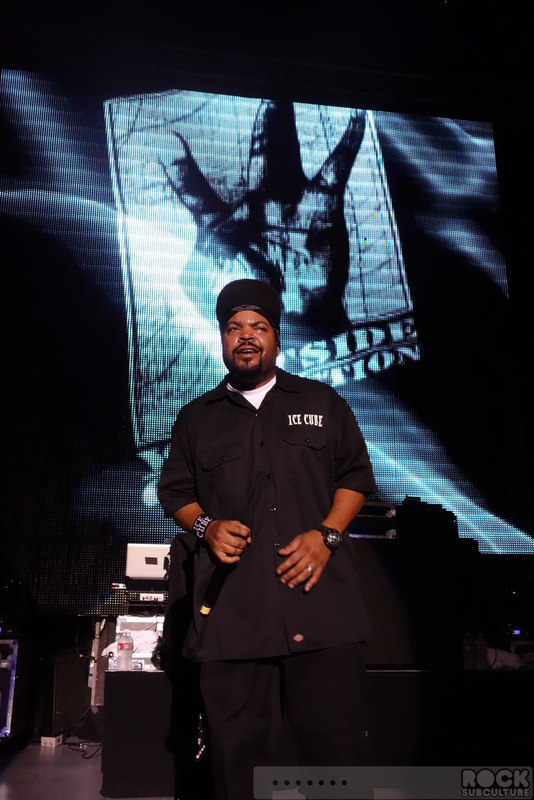 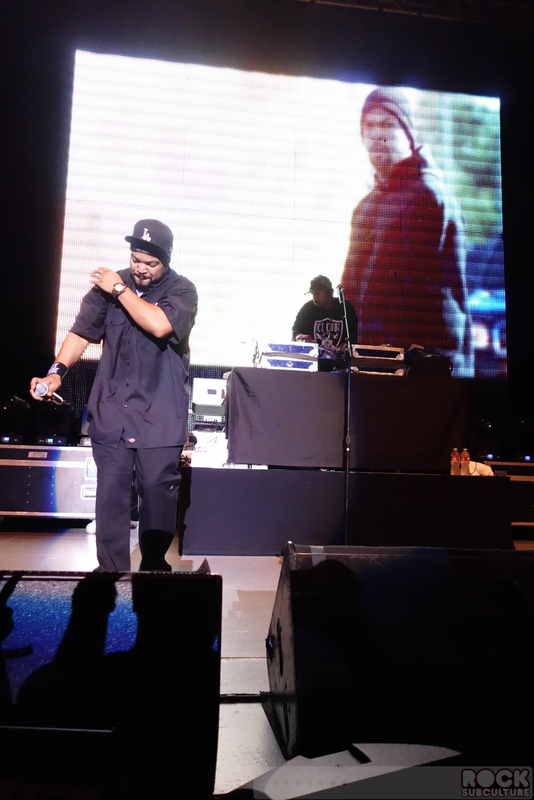 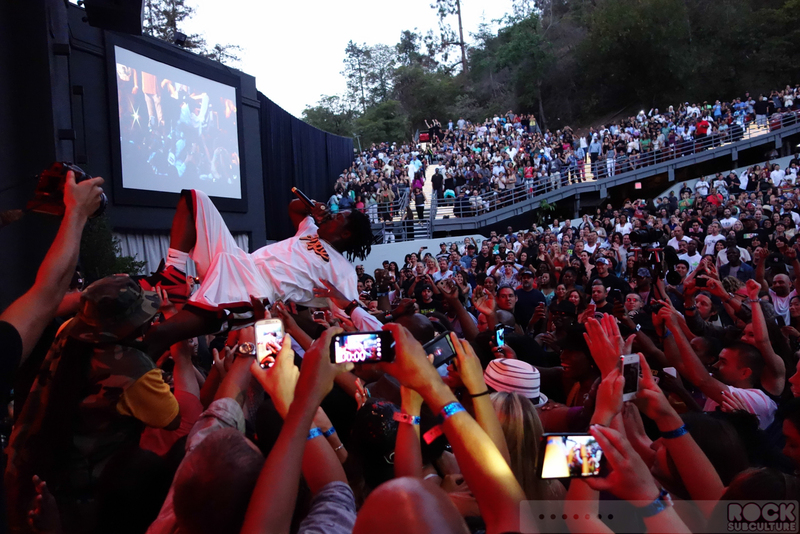 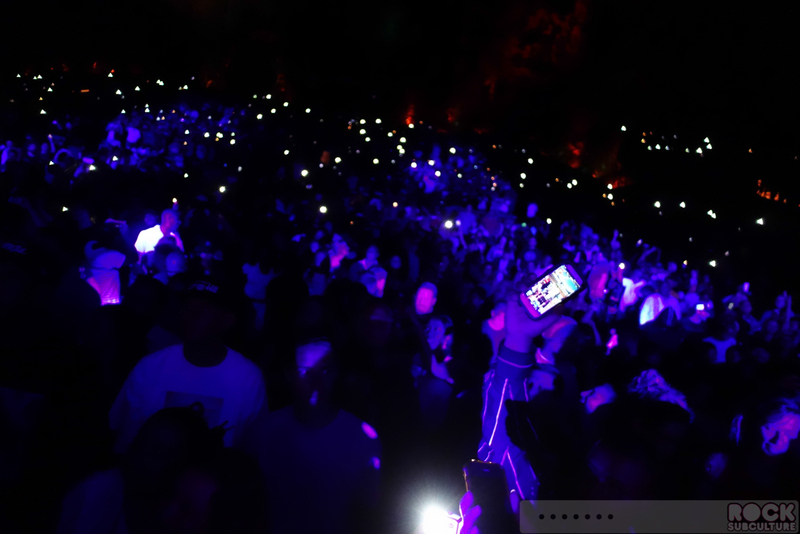 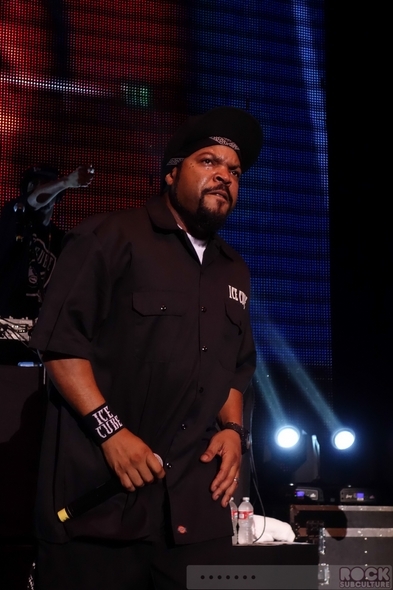 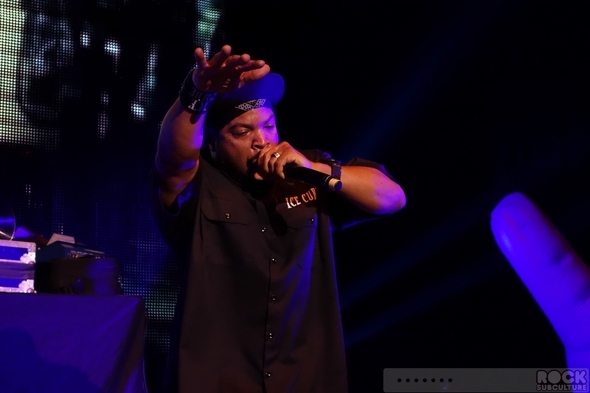 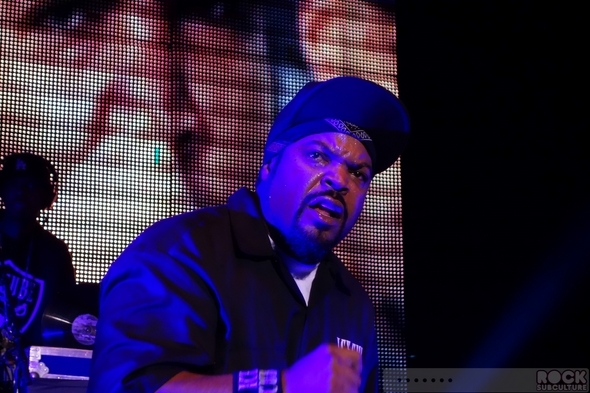 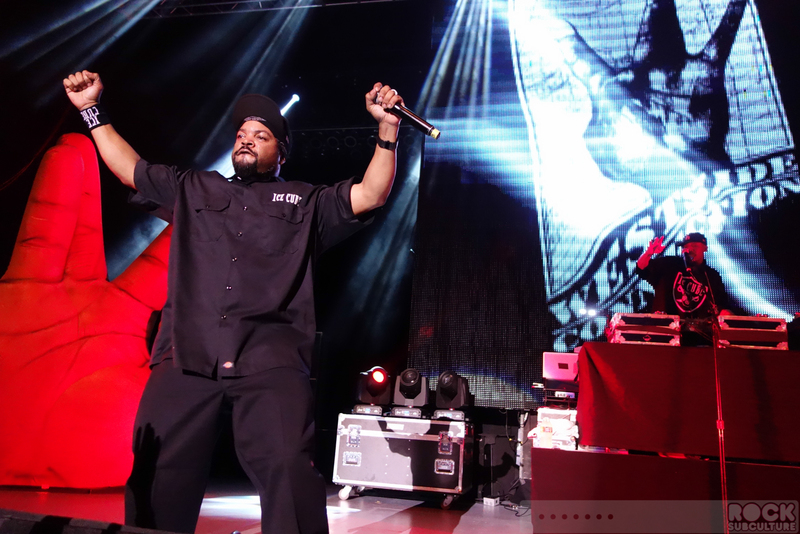 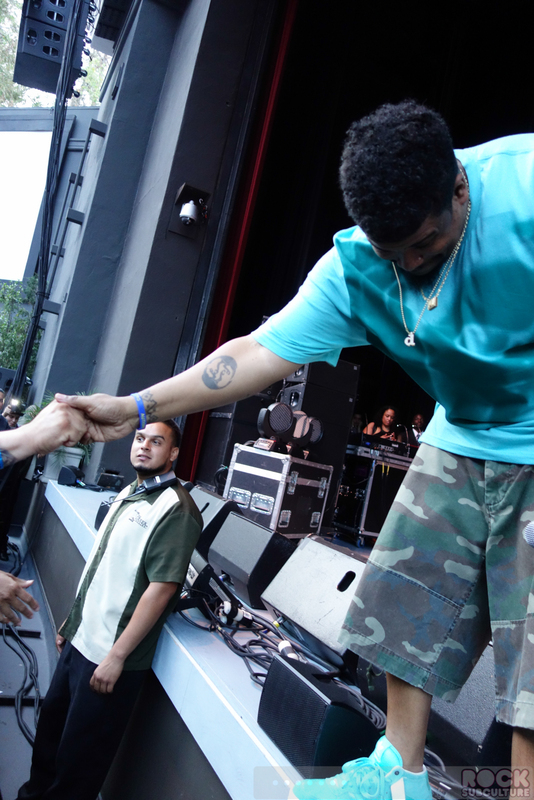 Joined by legendary artists Ice Cube, Public Enemy and De La Soul, the Tour will wrap-up in Los Angeles, at The Greek Theatre on July 7, 2013. This tour underscores what true authentic Hip-Hop music is based on, with these groundbreaking artists bringing their music to fans across generations. 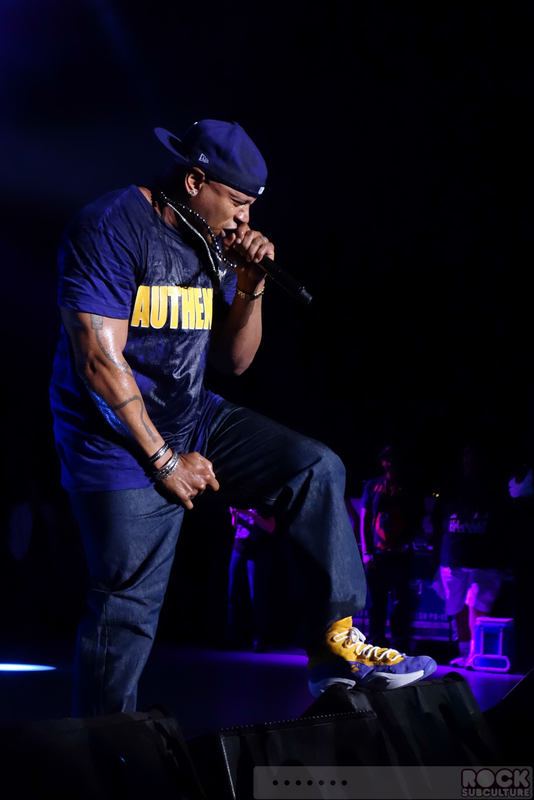 The tour will come on the heels of the release of LL’s 14th new studio album, Authentic, on April 30, 2013 on 429 Records/The Savoy Label Group. The multi-platinum artist returned to the studio and kicked the volume up to create a powerful album that came from his true passion for music and would speak to his fans. 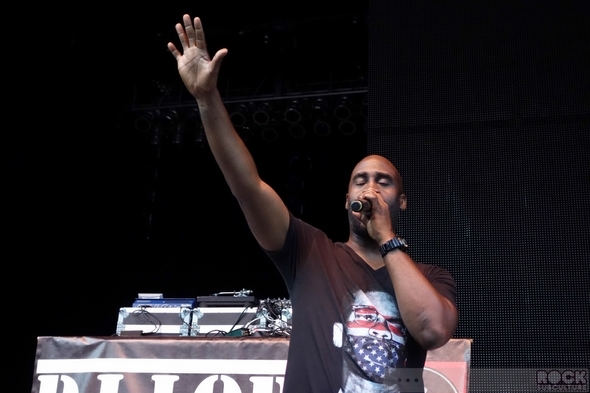 Celebrating his 30th year in music, Authentic features the iconic rapper in his element. 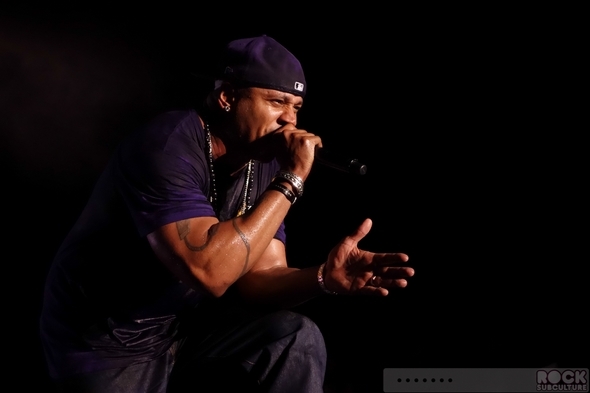 The Album is anchored by LL’s expressive attitude where his sensitive side is as present as his slicing lyrical switchblades. 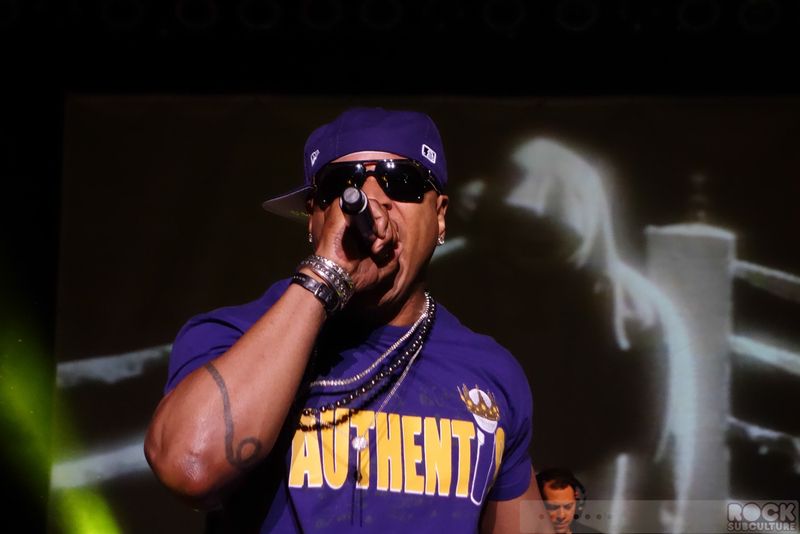 Authentic comes to life with crazy club jams, tender tracks, personal tributes, and hard-hitting commentary addressing the current hip-hop climate. First introduced to the world in 1984 as a Def Jam Records flagship artist, LL is the first rap artist to amass ten consecutive platinum-plus selling albums. 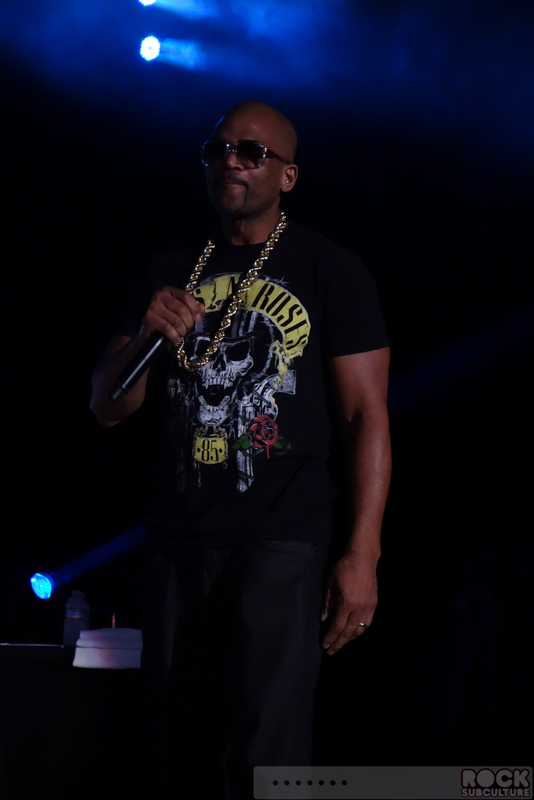 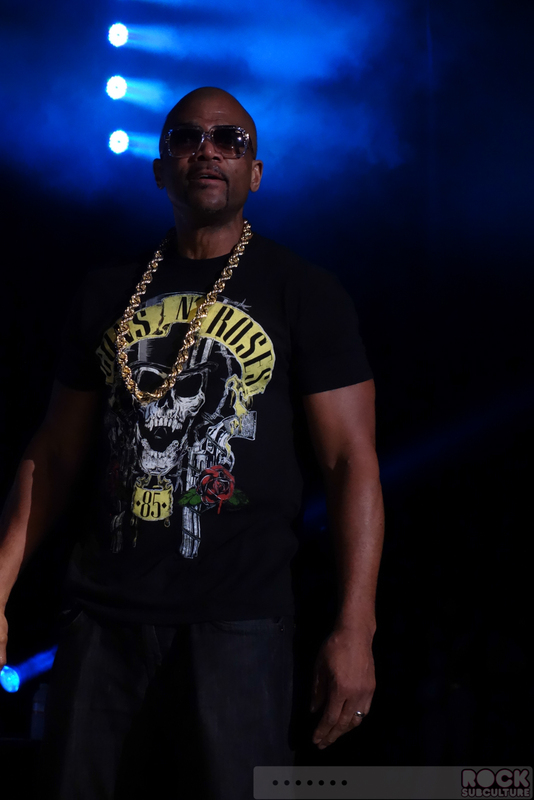 The multi-platinum artist and two-time Rock and Roll Hall of Fame nominee is currently tied for third place for most Billboard chart debuts by a rapper. 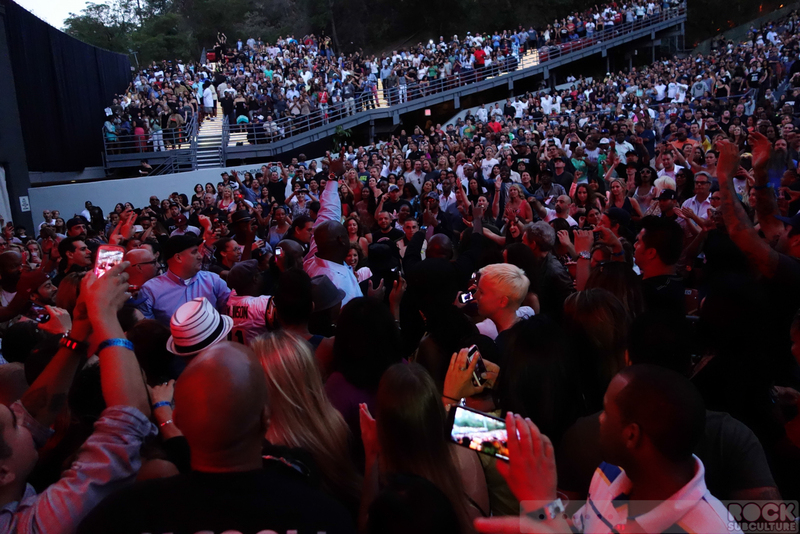 For three decades, LL has continued to influence hip-hop with rap ballads that captivate generations of audiences. 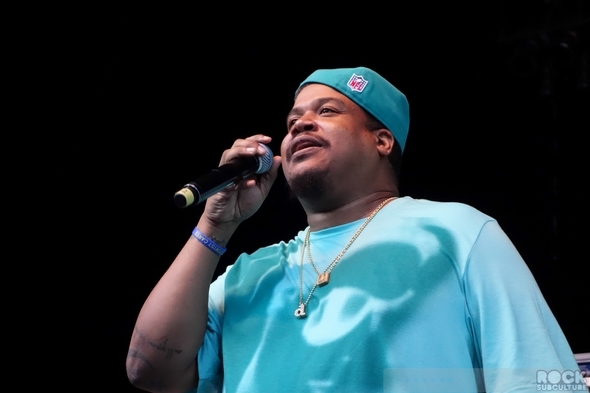 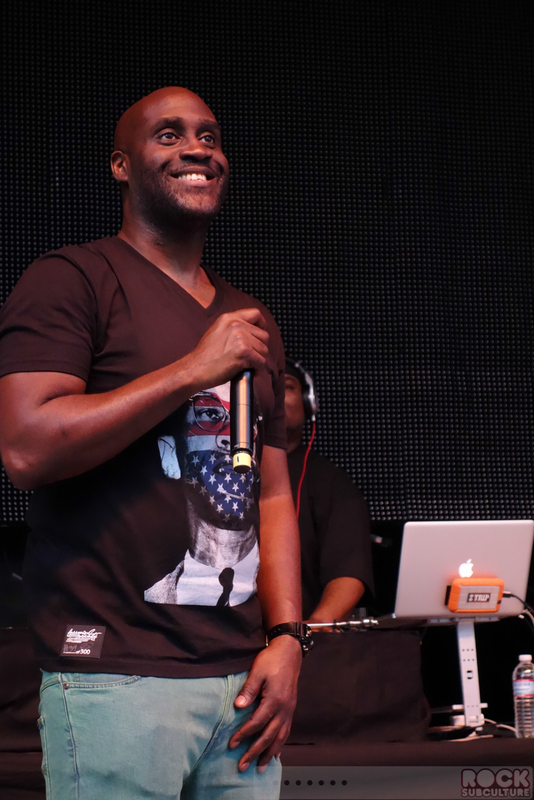 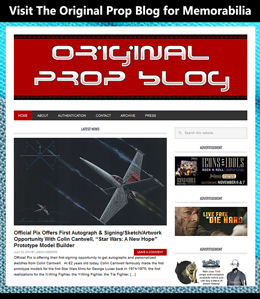 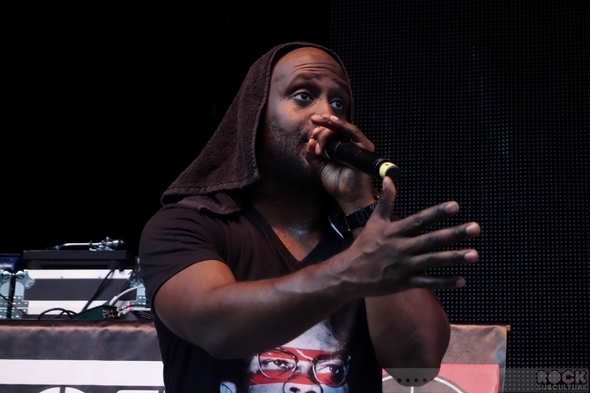 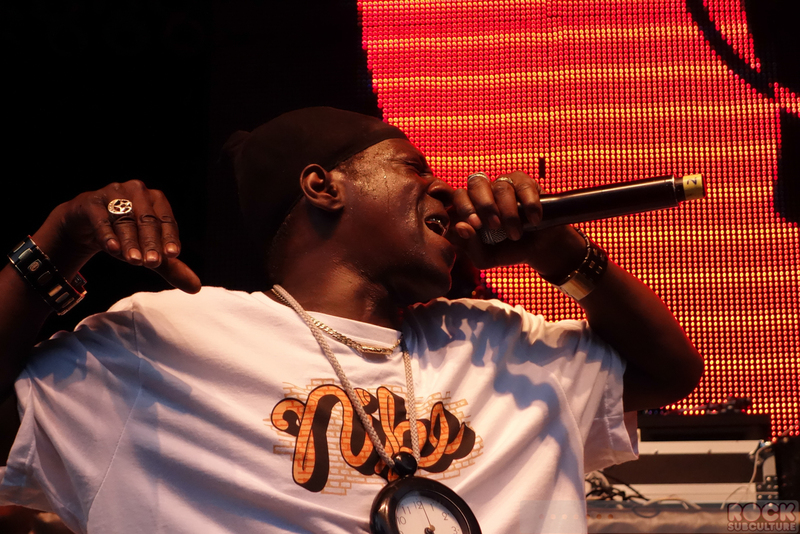 Since then, the veteran rapper has evolved his scope of work across entertainment appearing in numerous television and film roles, among many other projects. 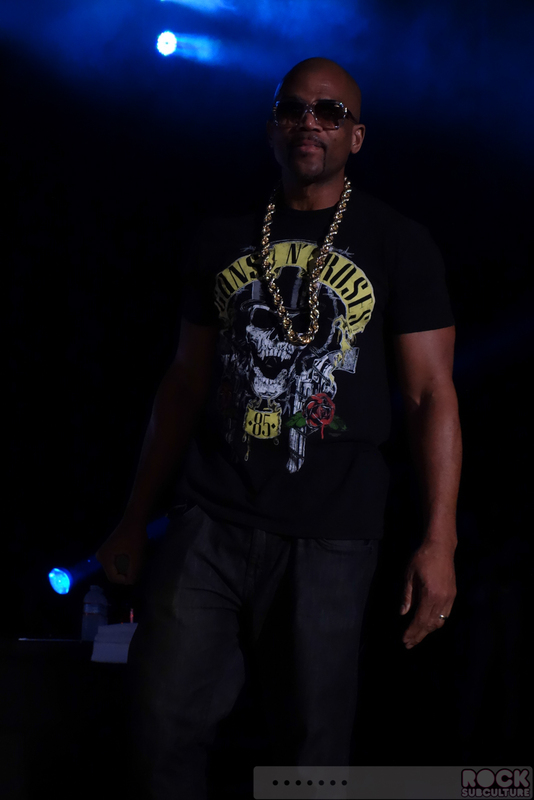 LL currently stars on one of the consistently highest rated shows on television, the CBS hit primetime drama series, “NCIS: LOS ANGELES.” His performance on the show has garnered him a NAACP Image Award for “Outstanding Male Actor in a Drama Series” three years in a row (2011 – 2013). 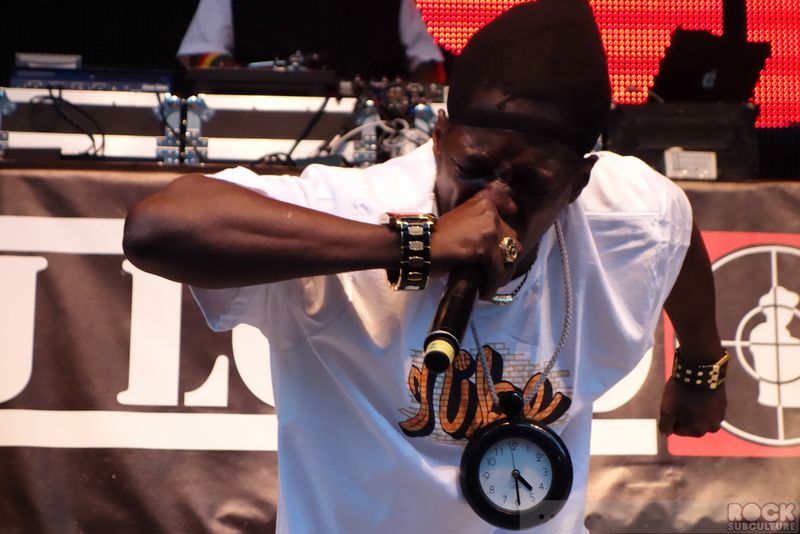 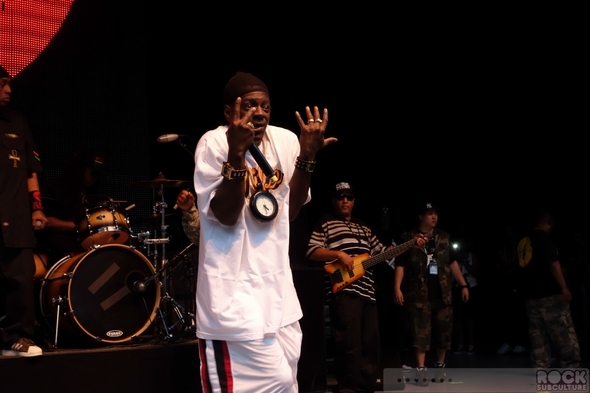 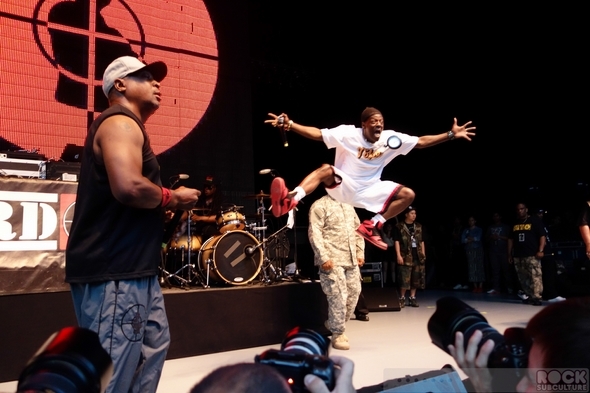 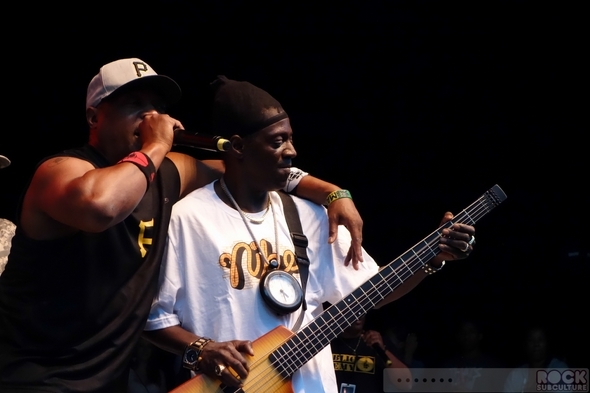 In early 2012, Public Enemy kicked off their 25th anniversary by staging a free concert in downtown Los Angeles’ notorious Skid Row. Just a few blocks away at the Grammy Museum, a special exhibit was being installed in their honor. 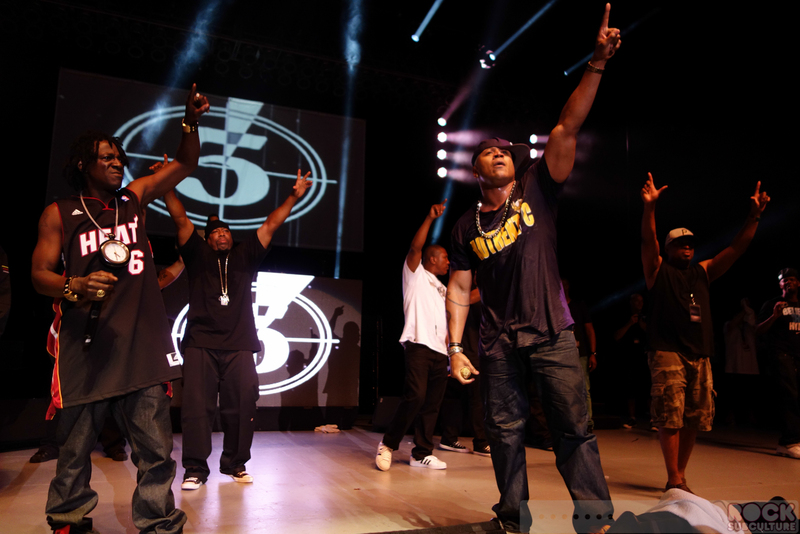 No other group could possibly mark a career milestone quite like this. 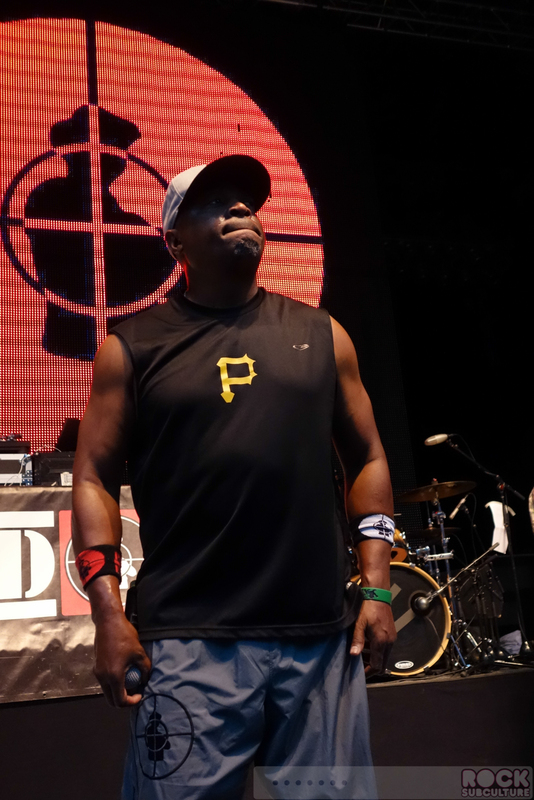 Every bit as compelling as their startling first single, “Public Enemy #1,” when it was released in 1987, Public Enemy have never stopped urging to fight the power as their artistry meets with unwavering critical acclaim and legions of worldwide fans. Fans that drove their single, “Harder Than You Think,” into the UK’s Top 5 last summer and prompted the Rock and Roll Hall of Fame to induct the group in 2013 – their first year of eligibility. The Greek Theater is a nice venue, and while outdoors, it is not anywhere near as vast at the Hollywood Bowl. 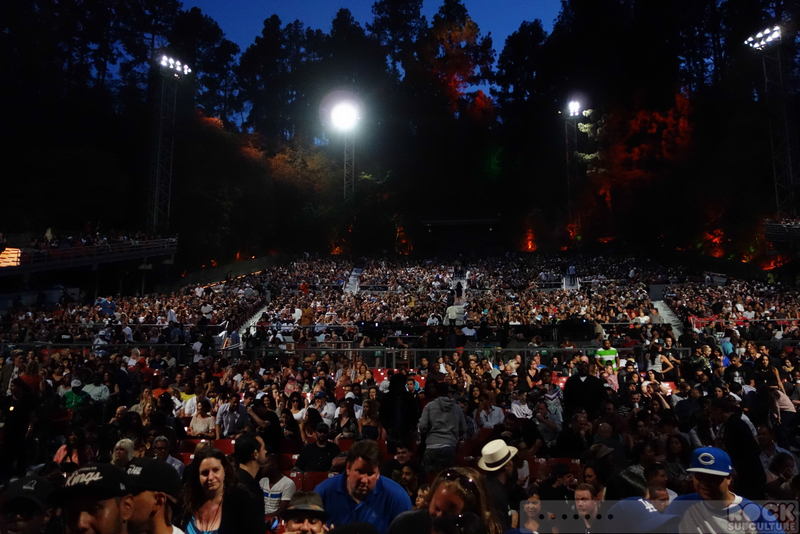 All the same, the show was a sell-out, and ever seat appeared to be occupied. 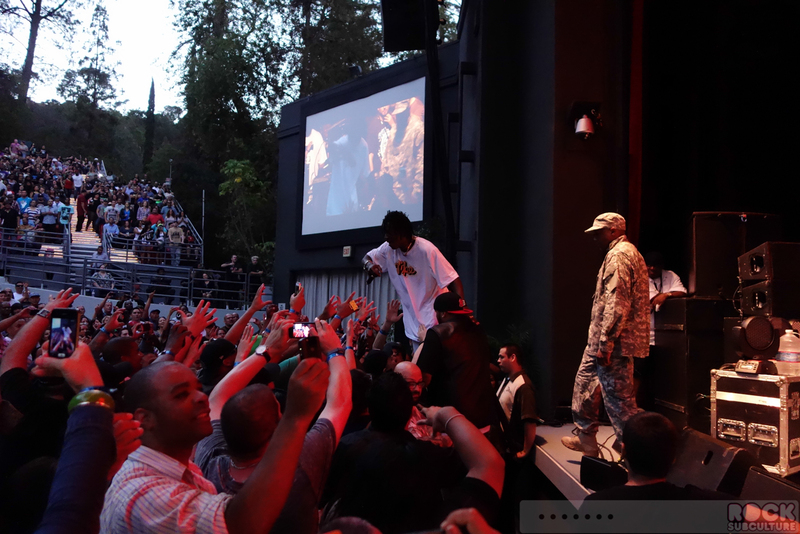 I had a ticket for the general admission pit in front of the stage, and had early entry as part of a VIP Nation package. 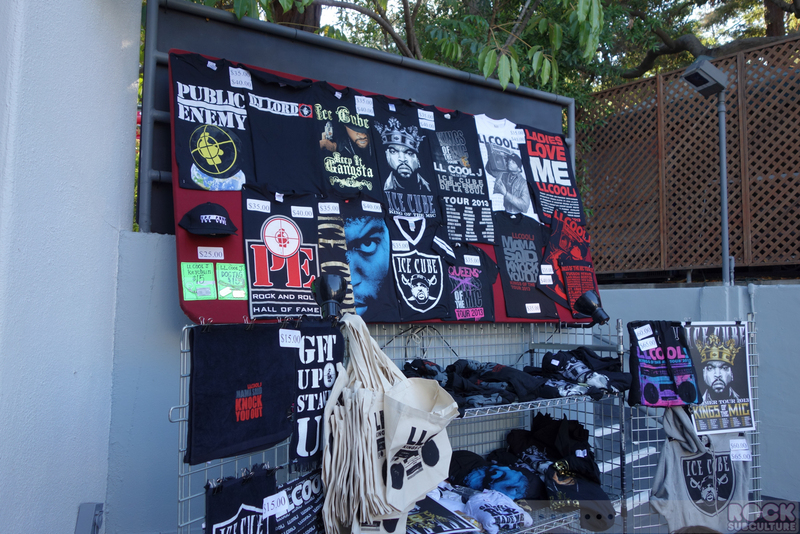 Funny enough, though it was marketed as early entry, we were told at the show that it didn’t mean early entry into the GA pit… but to the merch table! 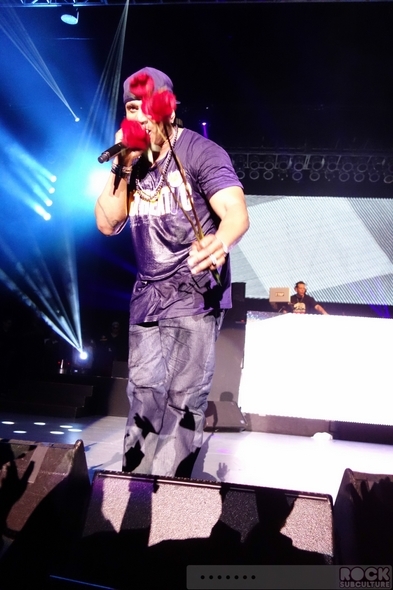 Kind of laughable. In any event, I still managed to get in at the start, and took a spot in the front row on the rail. 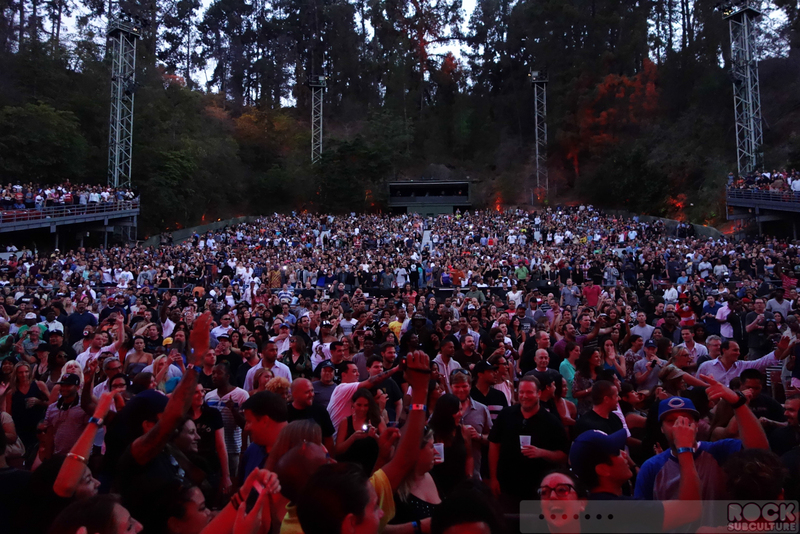 The Greek has a very low stage and the barricade between it and the crowd leaves very little room, making for an intimate show if you are up front. L.A. audiences have a reputation for being lousy concert audiences, but that was not the case at this gig. 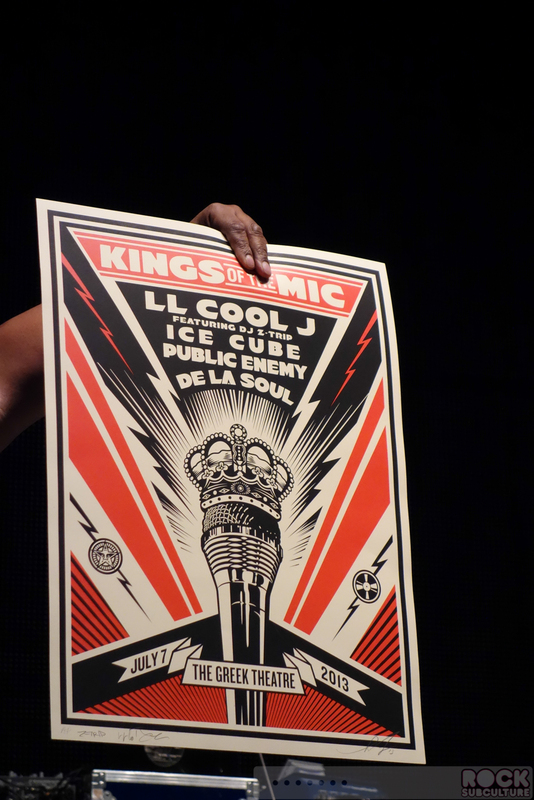 Well, I suppose it could have been, but either they were hard code old school hip hop fans, or the artists on stage turned them around 180 degrees (from talking with many others there, I assume it was the former, and the latter built upon that). It was an awesome crowd totally dialed into the show. 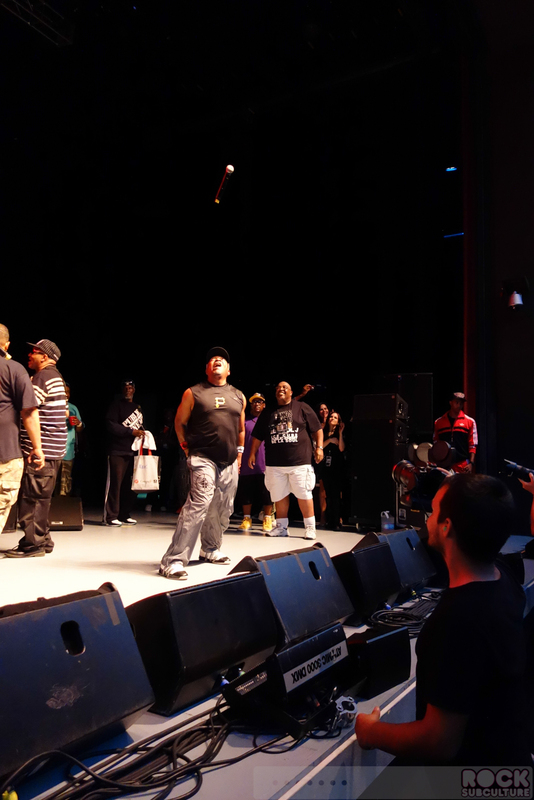 Funny thing is we were quizzed during one of the sets about our ages, and going by audience response, there was a definitely minority of concert goers under 30 for sure (and many more “old school” hip hop fans than “new school”). I was a big fan going back to Bigger and Deffer from 1987, but had never seen him in concert before, and as much as I had high expectations, he really blew them out of the water. 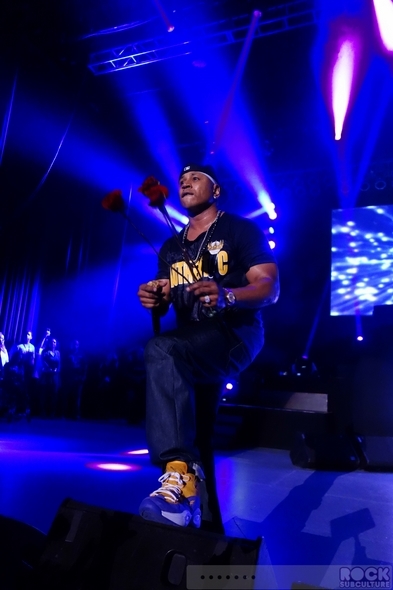 He’s still got it, and looks like he hasn’t aged since the 80s. Totally surreal moment for me. 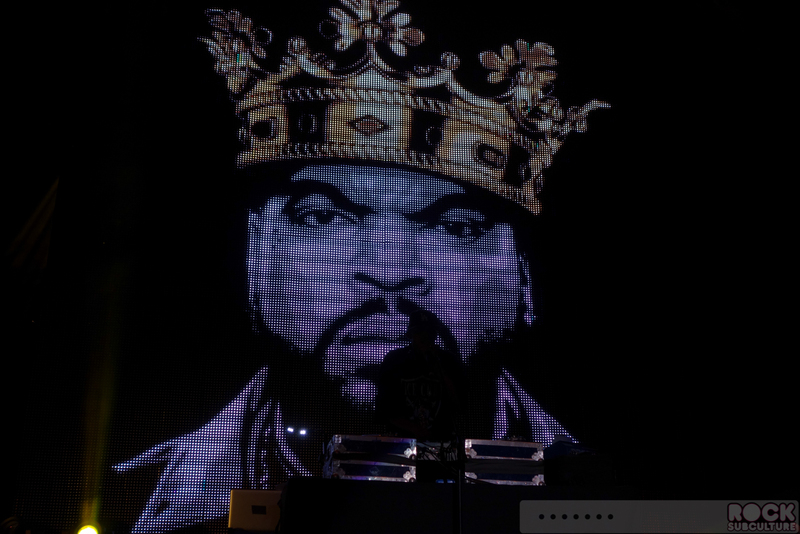 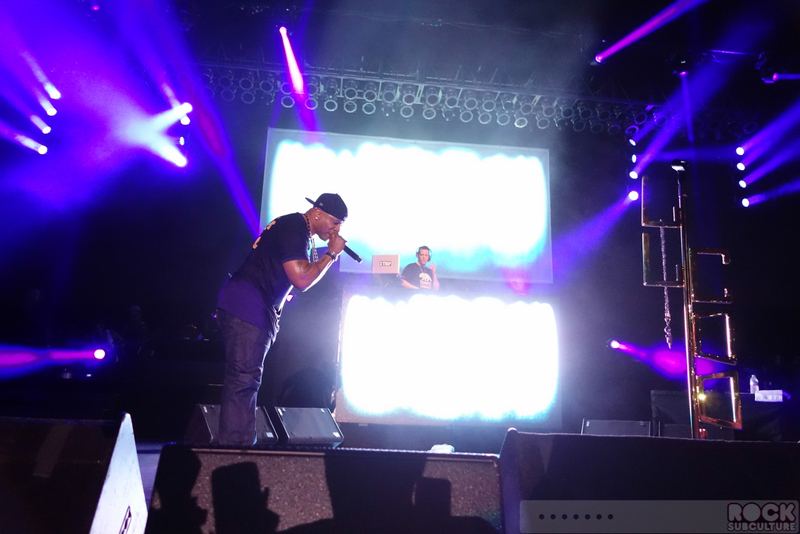 DJ Chuck Chillout got things started for the night, which consisted of fairly show sets of 15-30 minutes, with Ice Cube running over at about an hour and LL Cool J going past his scheduled one hour set as well. 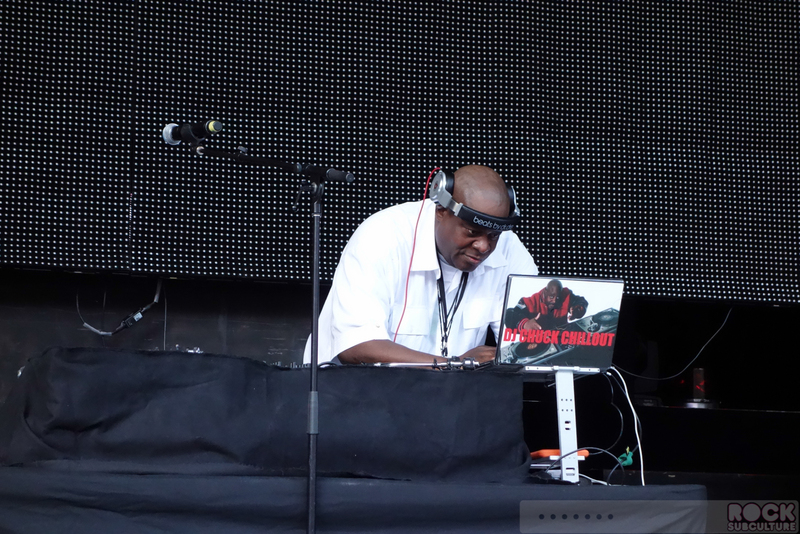 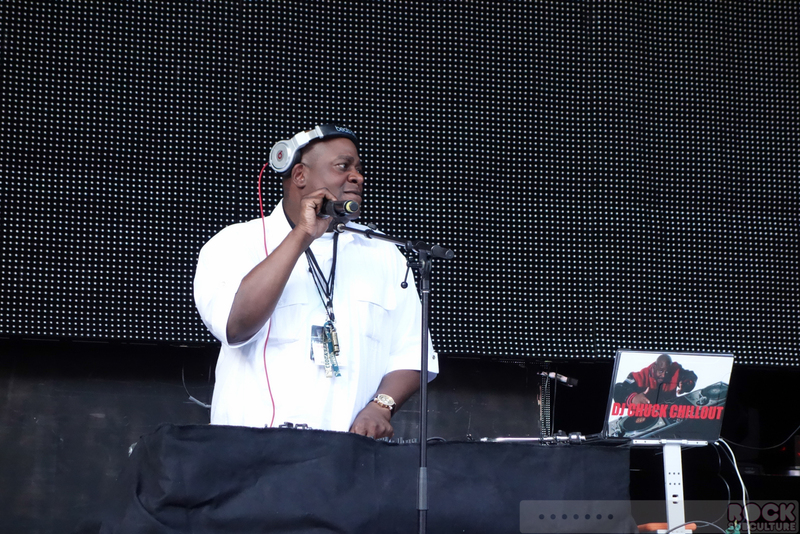 DJ Chuck Chillout was an amazing DJ and played all the great hits. 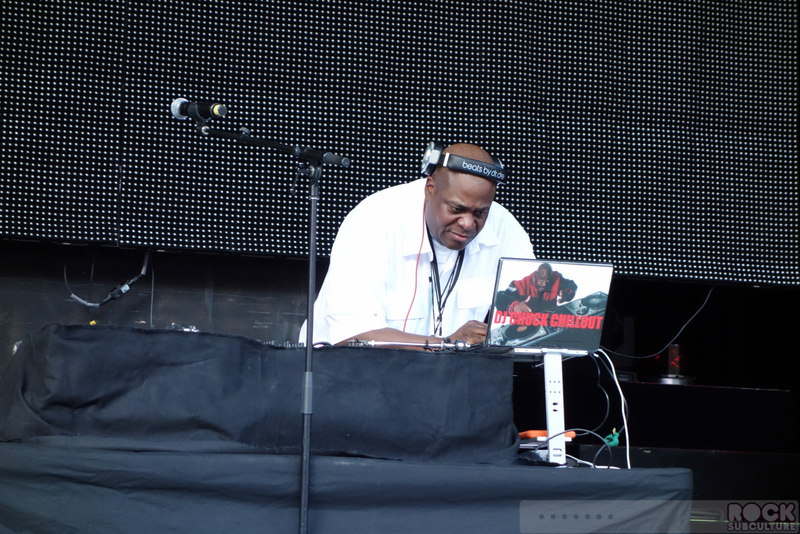 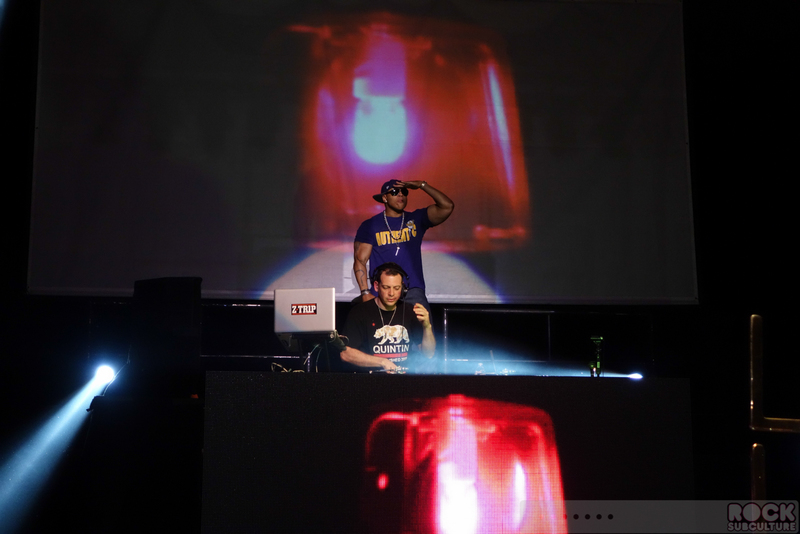 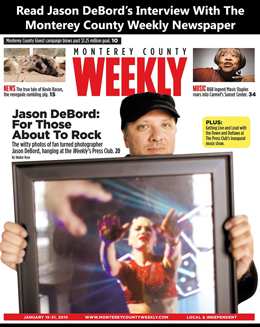 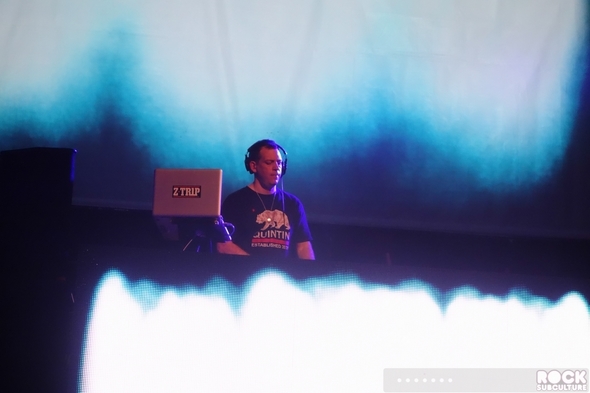 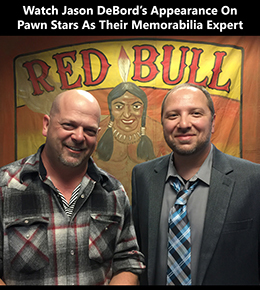 I would definitely show up to an event with him spinning some vinyl – great mixes! 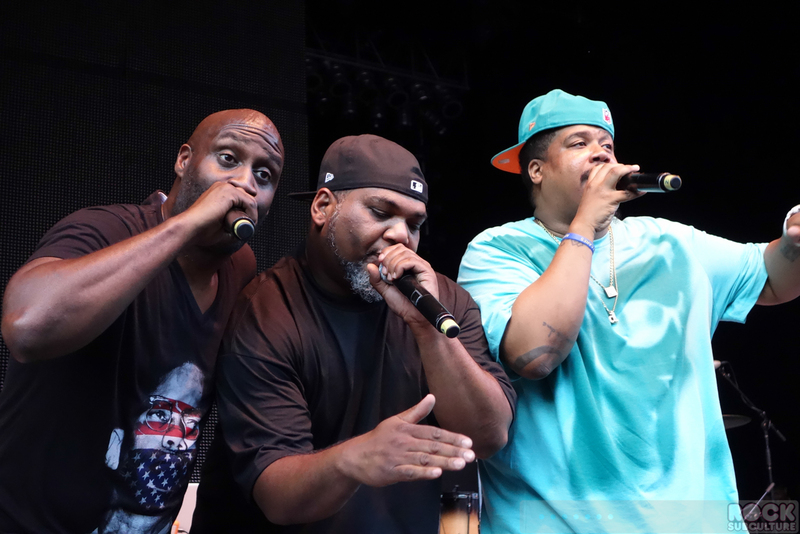 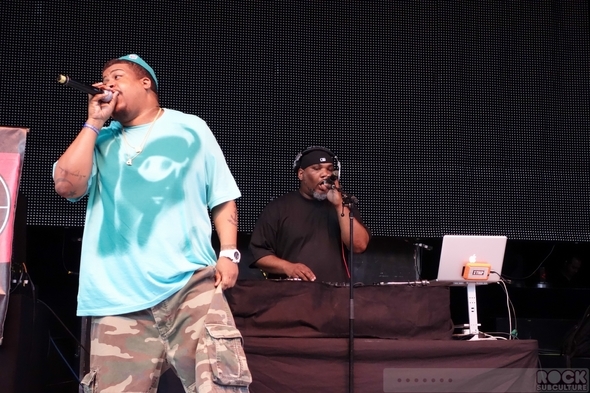 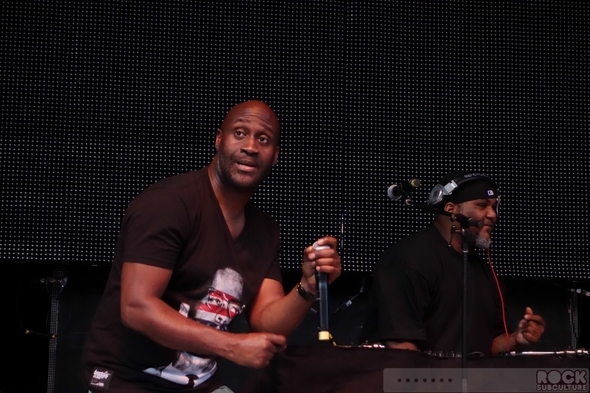 De La Soul came on the scene in the second half of the 80s, but definitely were pioneers in hip hop, with their unique take on music. 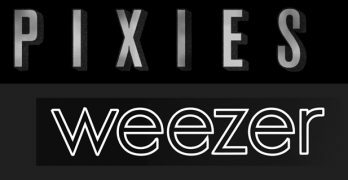 Retrospectively, you can see their influence on some real top acts that came after them. The Grammy Award-winning group are best known for the hit single, “Me, Myself, and I”, though I don’t think that is best representative of their work overall. At the gig Sunday night, they definitely brought energy and excitement to the stage that carried through, and with their short left left you wanted more and wondering about whether they might have a bigger place in music down the line, in the future. 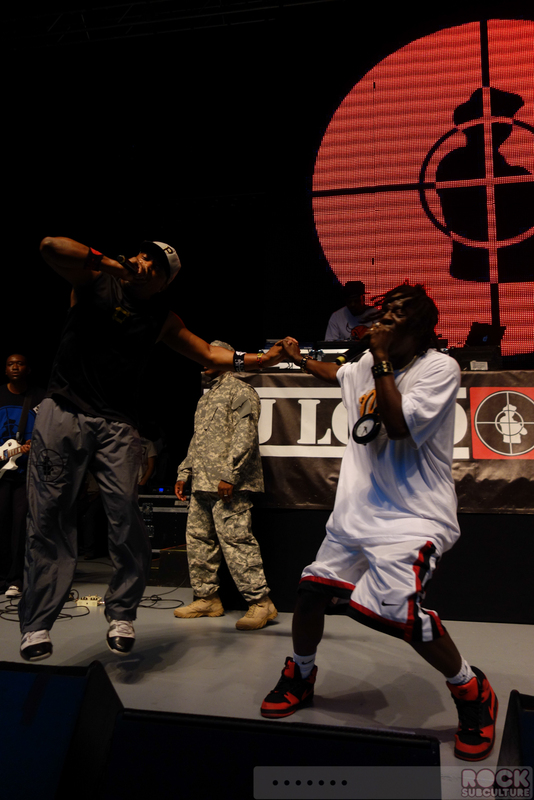 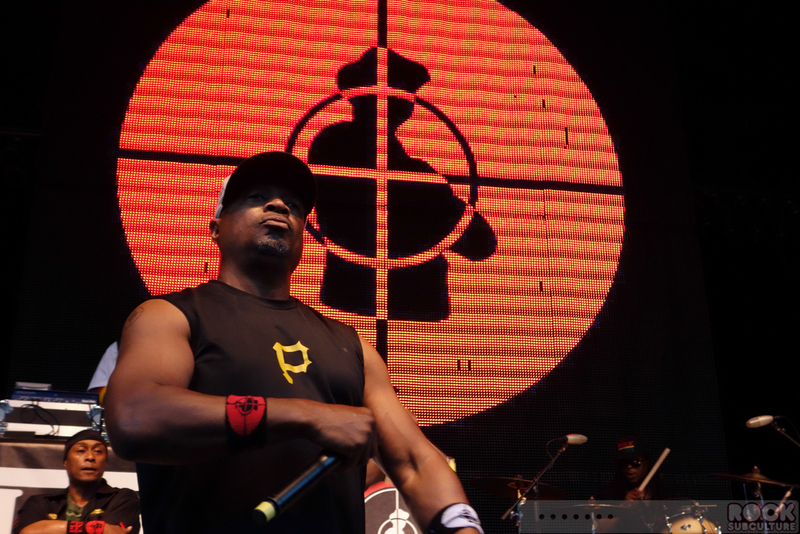 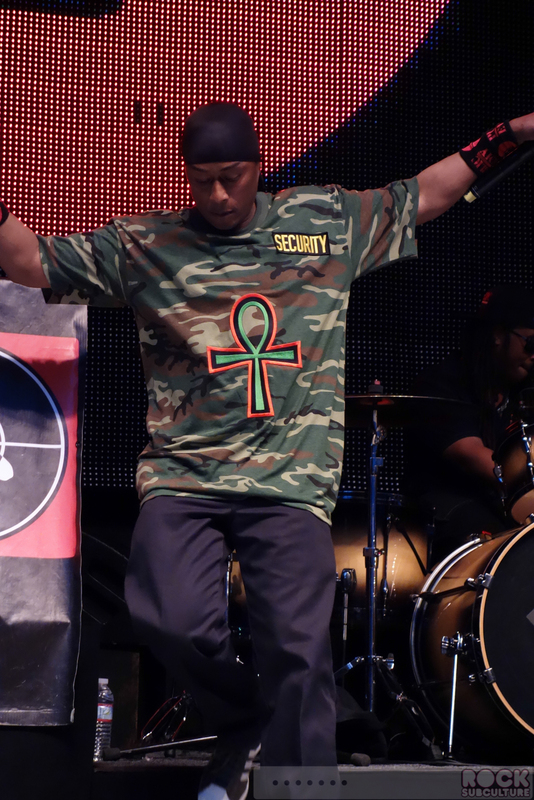 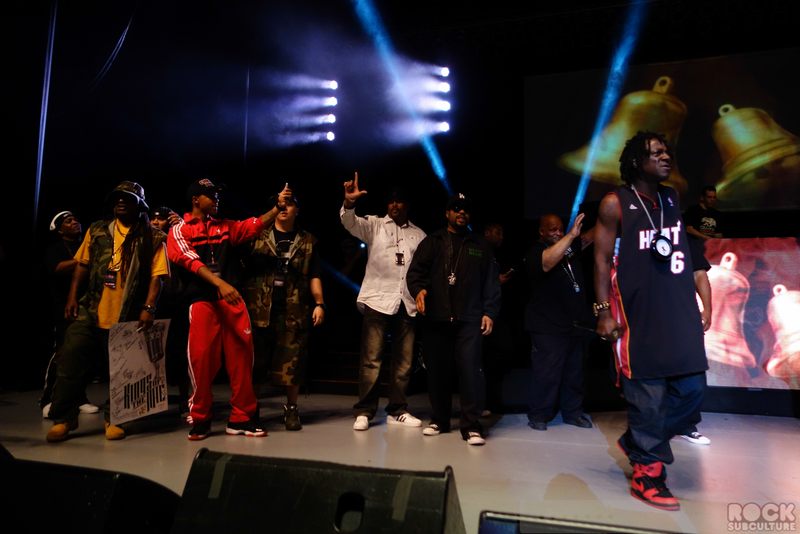 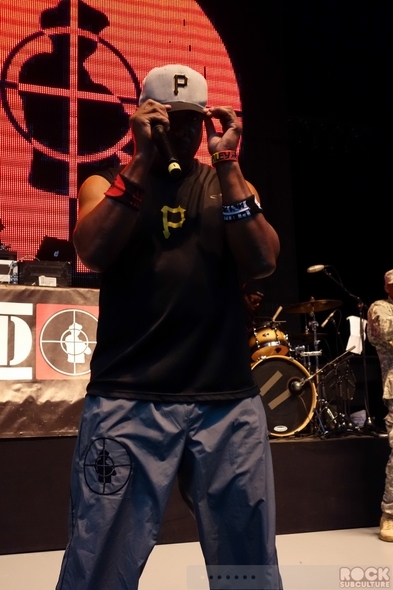 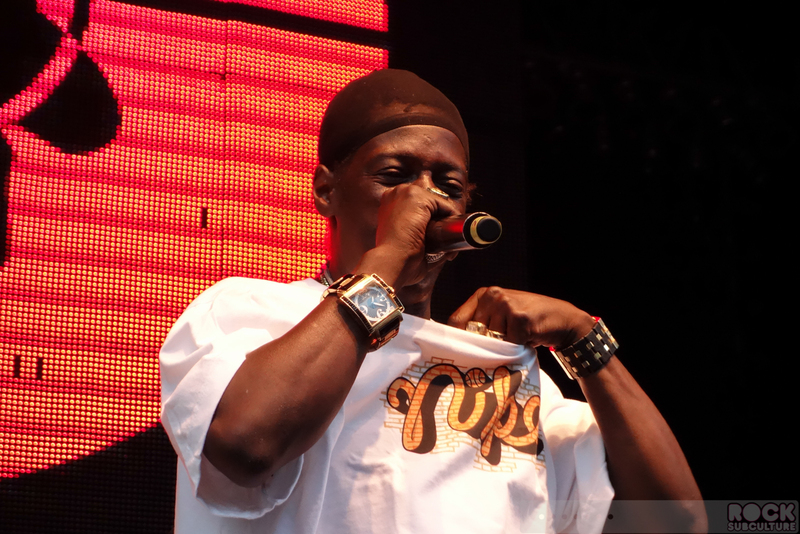 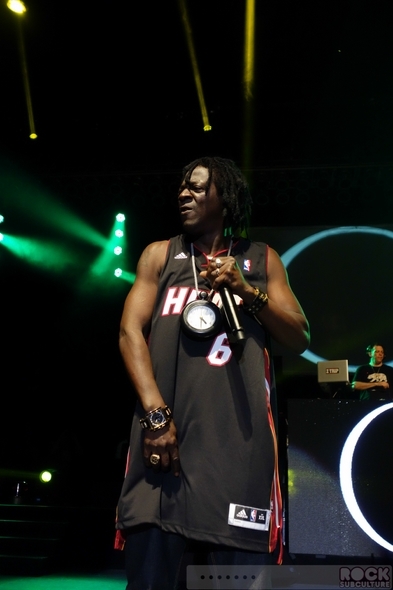 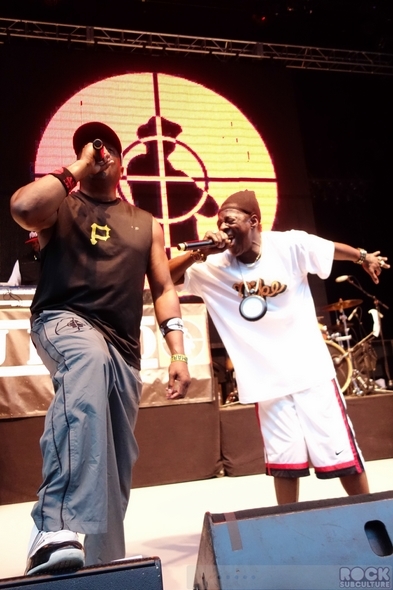 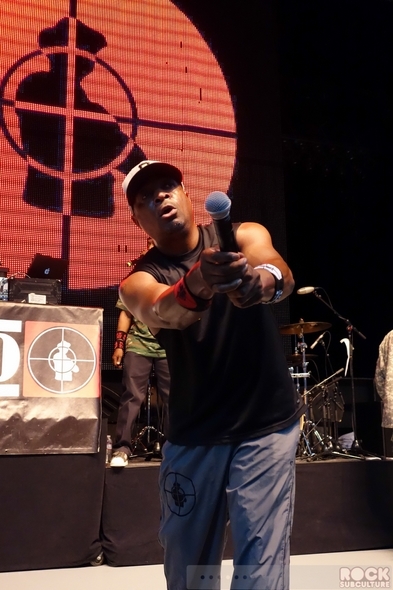 Public Enemy is of course one of the most famous and renown hip hop groups in history. 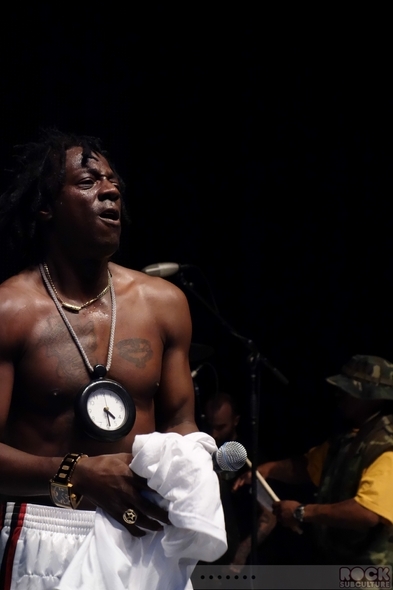 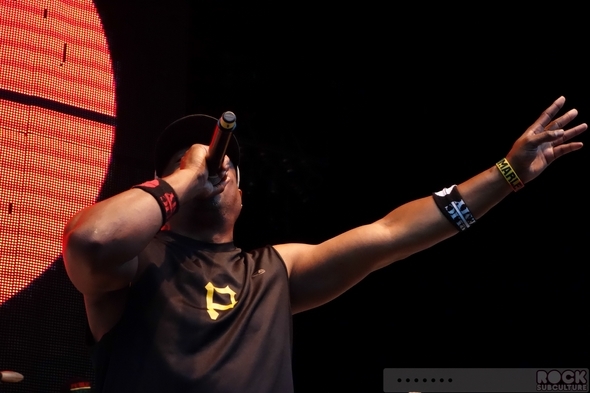 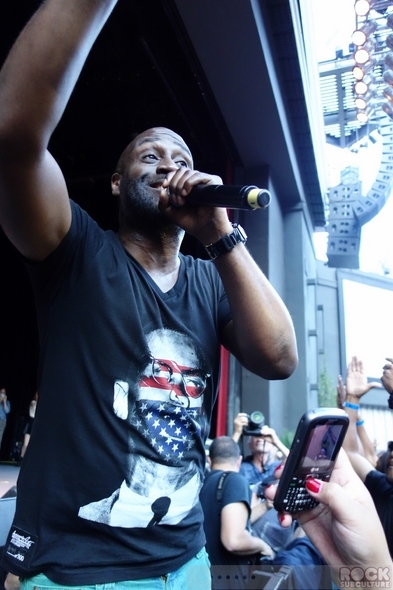 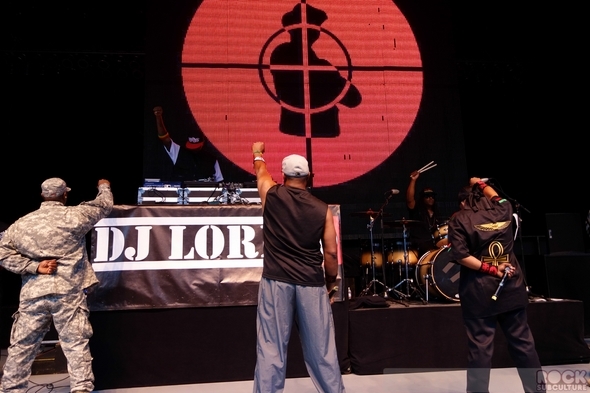 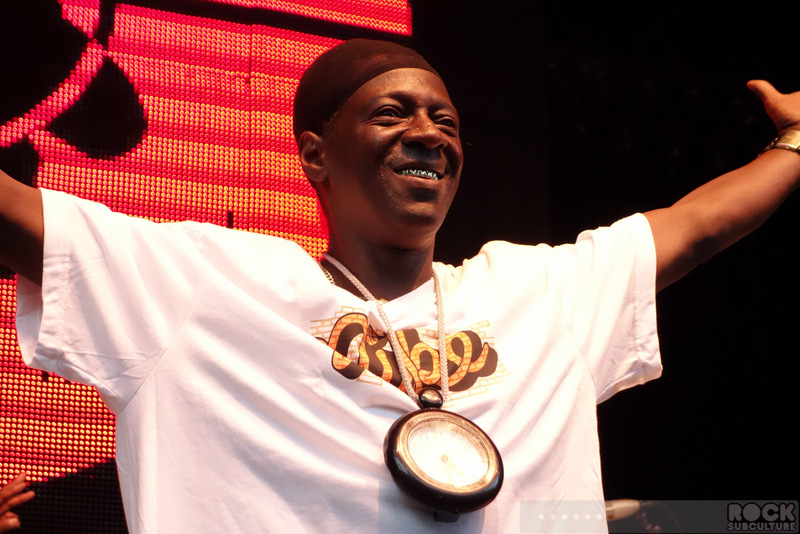 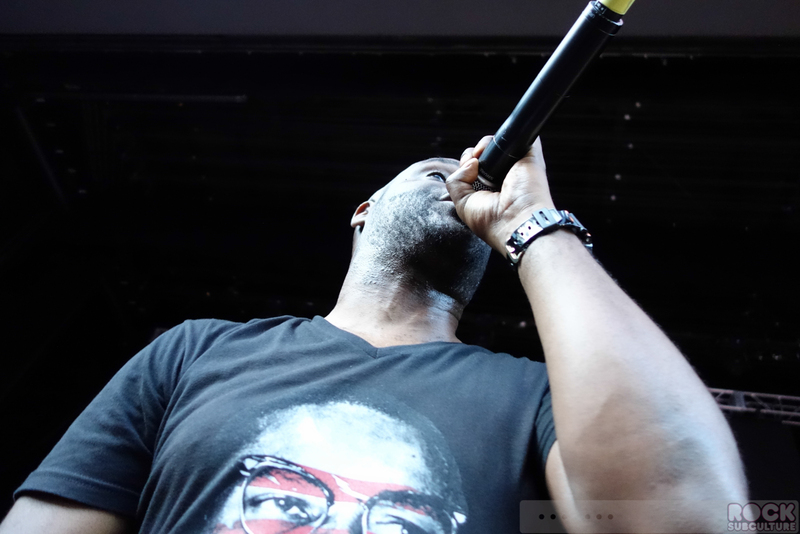 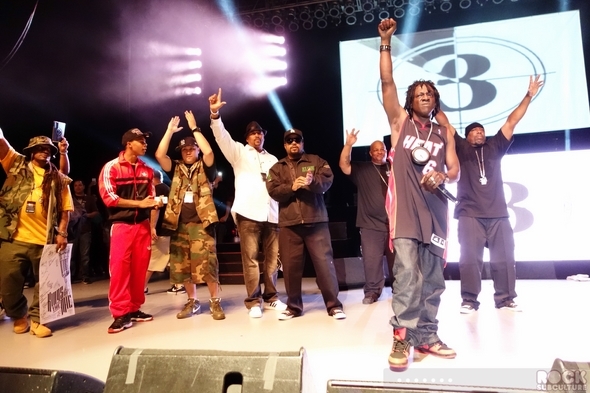 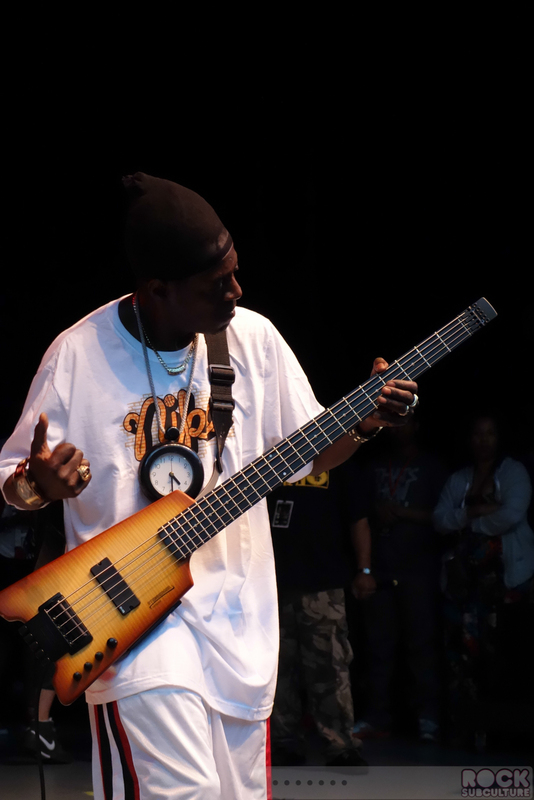 Chuck D, Flavor Flav, and DJ Lord do things their way, and have certainly built the identity of their group around their larger than life personalities. 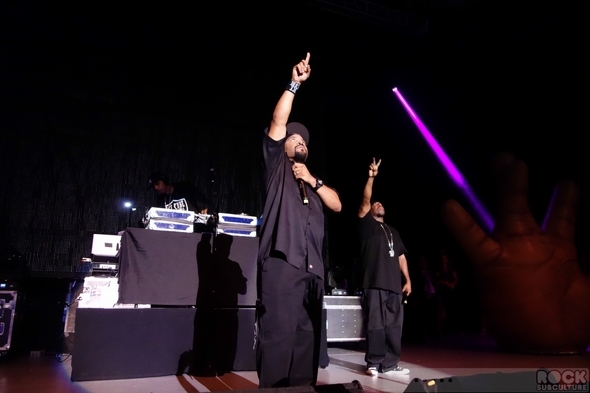 They are one of only four hip hop groups that have been inducted into the Rock and Roll Hall of Fame (just this year), and have used their music to express views on politics and criticize. 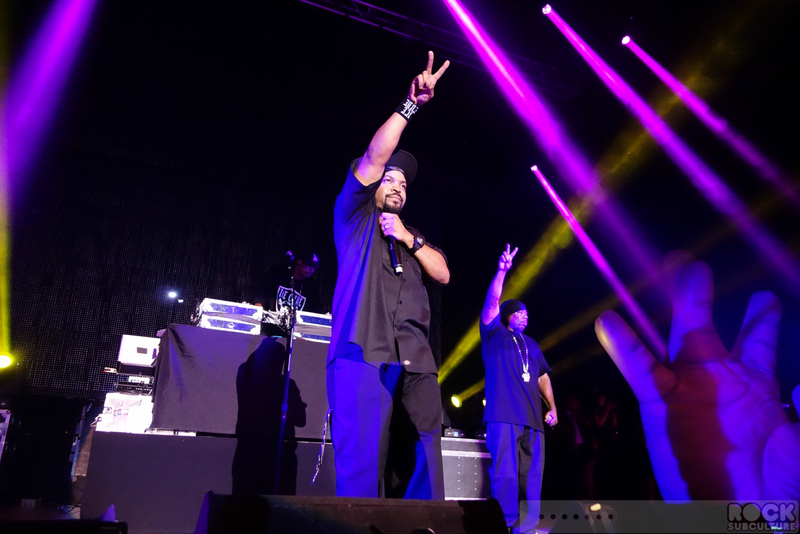 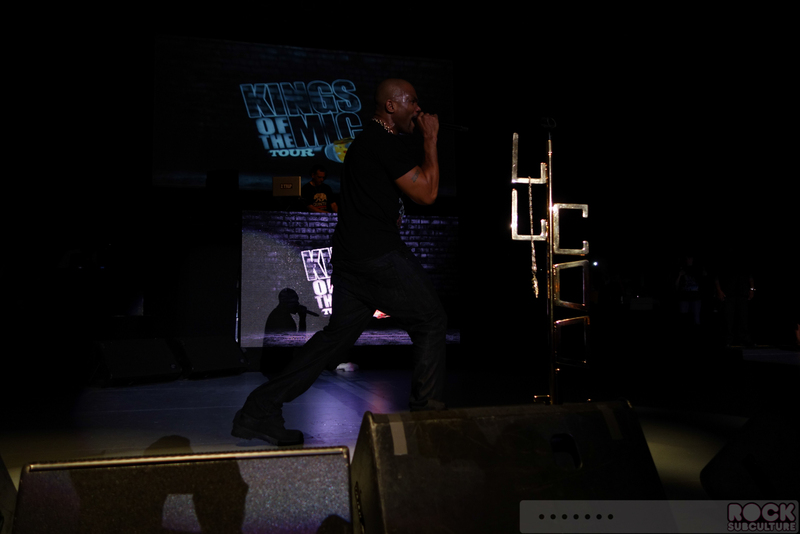 An act of obvious headlining stature themselves, the fact that they were smack dab in the middle of a line-up with their set I think speaks to the name of the tour itself – Kings of the Mic – and the quality of the entertainment at this show. 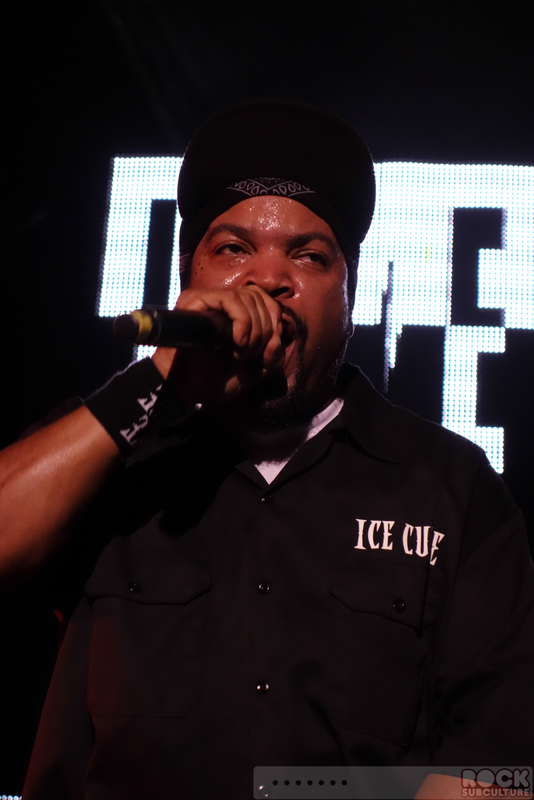 Ice Cube – even recognizable to those who don’t know his music due to his work in film and television – was part of N.W.A. 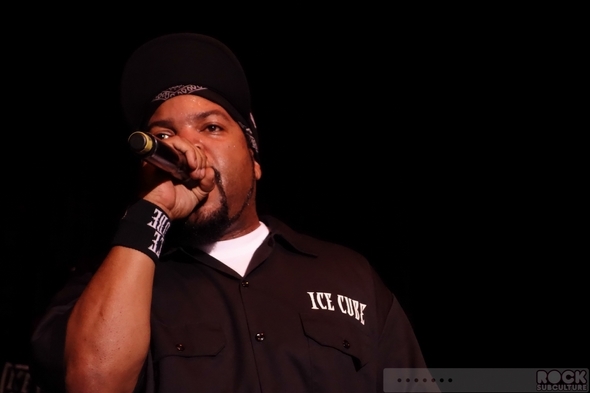 in the late 80s and then went on to do his own music. 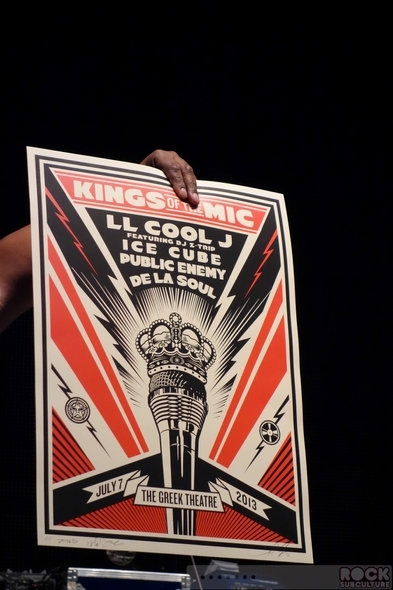 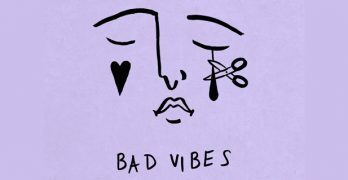 Both highly regarded and controversial, the popular MC has also used the medium to explore new territories in music and politics. 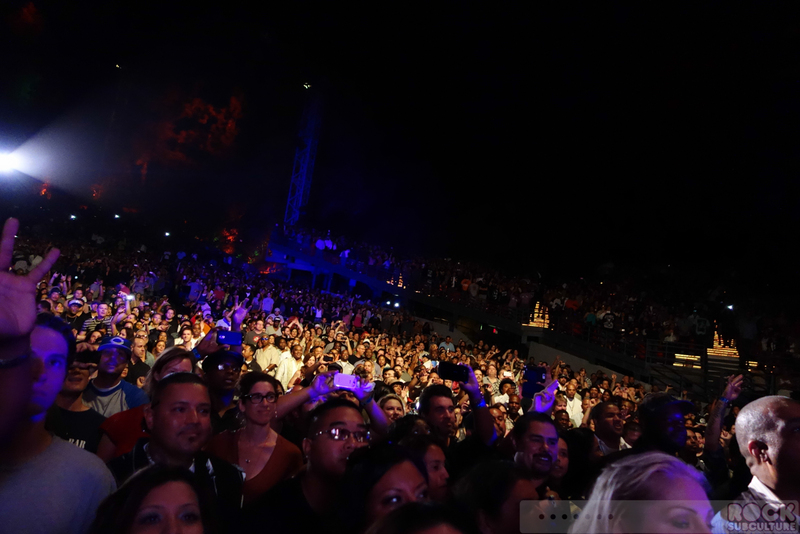 What struck me most about his performance was his passion and energy, which seemed boundless. 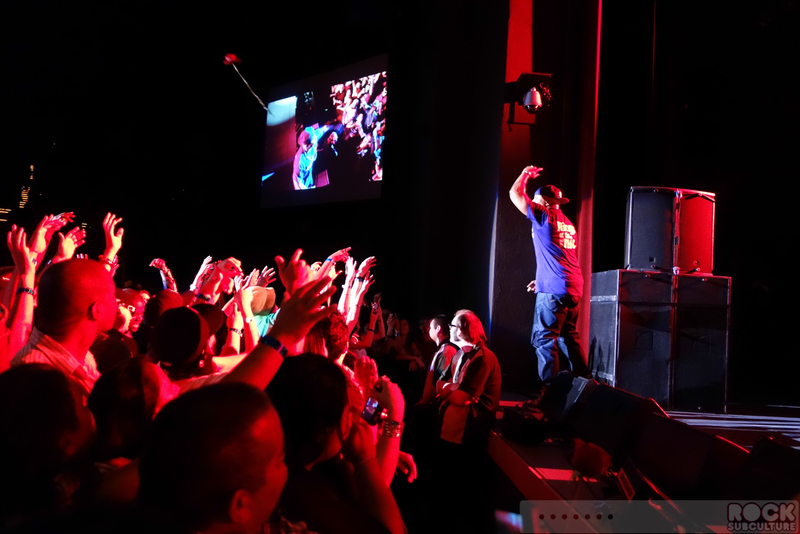 I know from talking to some in the audience that he was their favorite artist on the bill, so again, it was kind of like a triple headliner show. 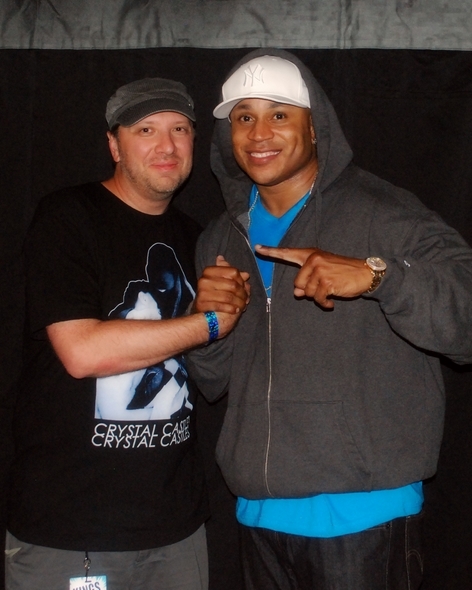 LL Cool J was probably the third rap artist I got into, after Run-DMC and the Beastie Boys. It really blows my mind that the man is only five years older than me, and accomplished so much at such a young age, and perhaps more impressively has seemed to lead a life in which he has stayed true to himself, and found even more success in other artistic disciplines. 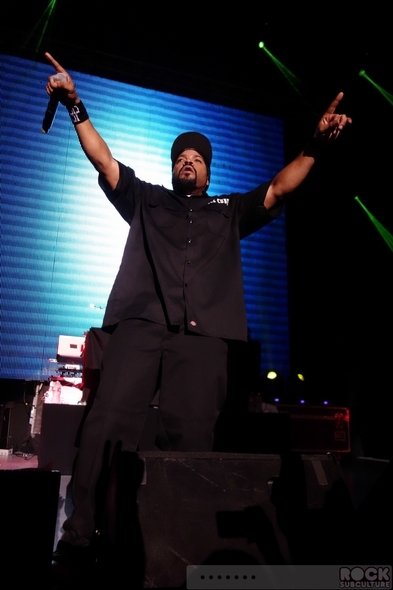 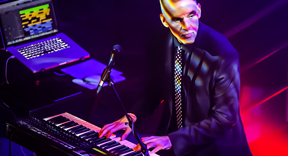 Even with his work in film and television, and has remained prolific with music, having released 13 studio albums. 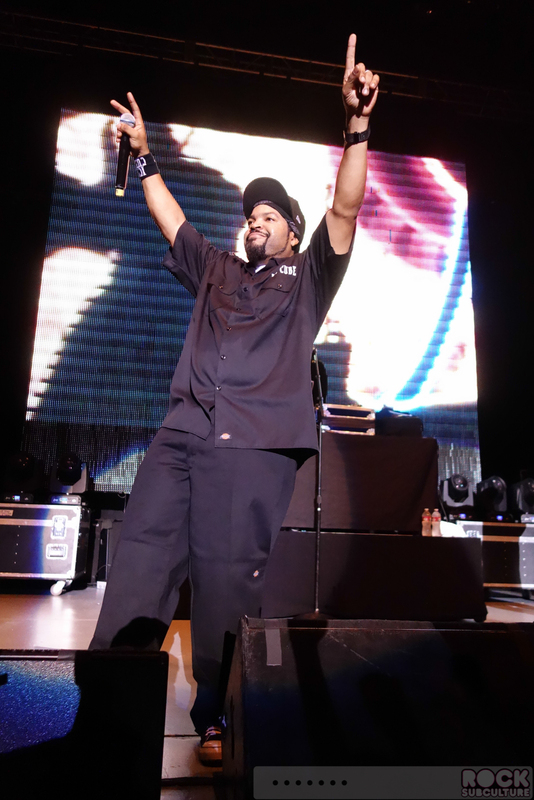 Like Run-DMC, he had real success in crossing over into the mainstream, and paved a way for others to follow. 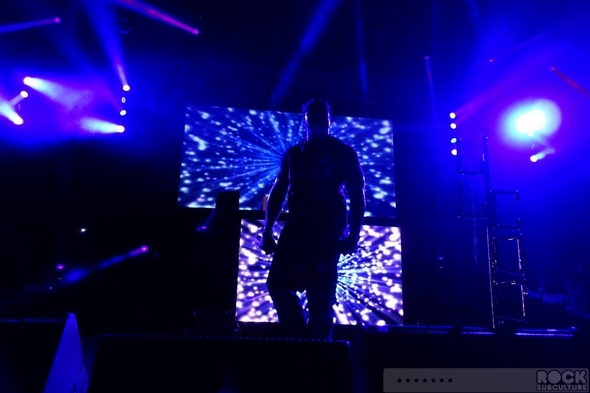 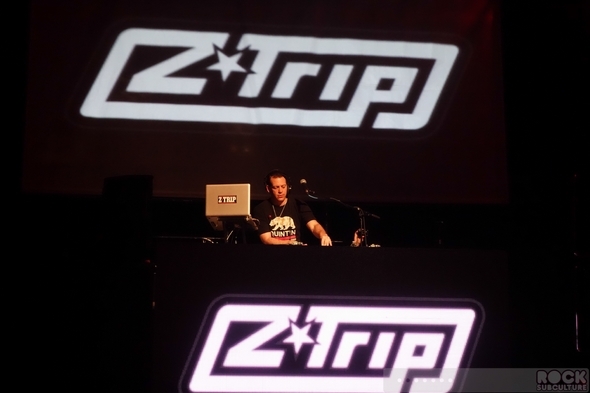 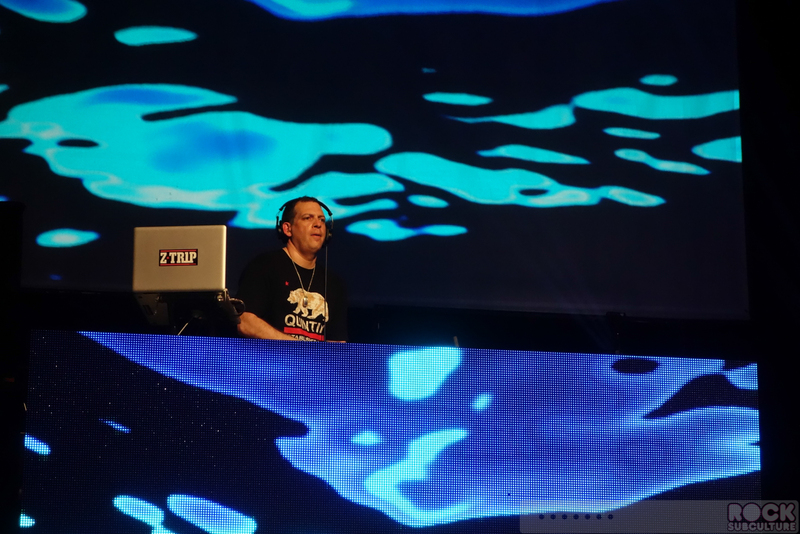 With the show last night, he didn’t pull any punches and opened with “Mama Said Knock You Out”, following some intro work by DJ Z-Trip. 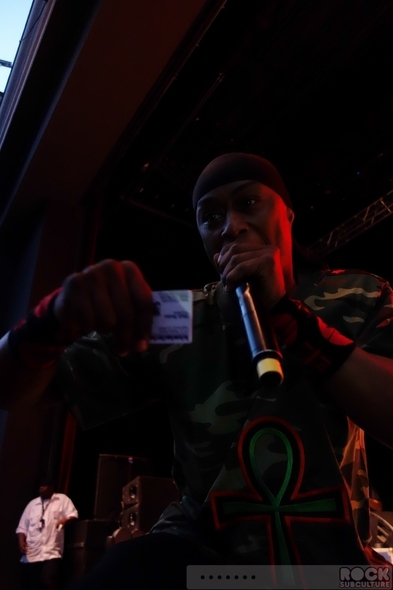 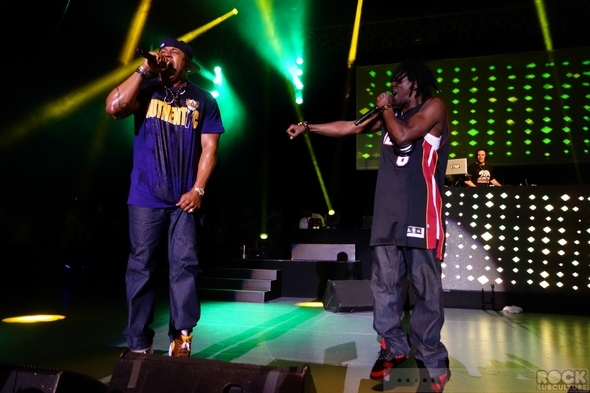 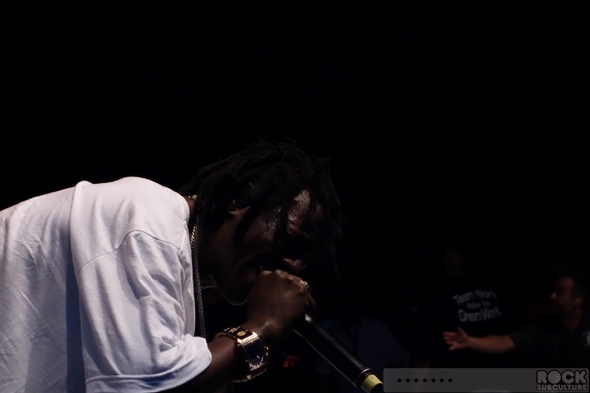 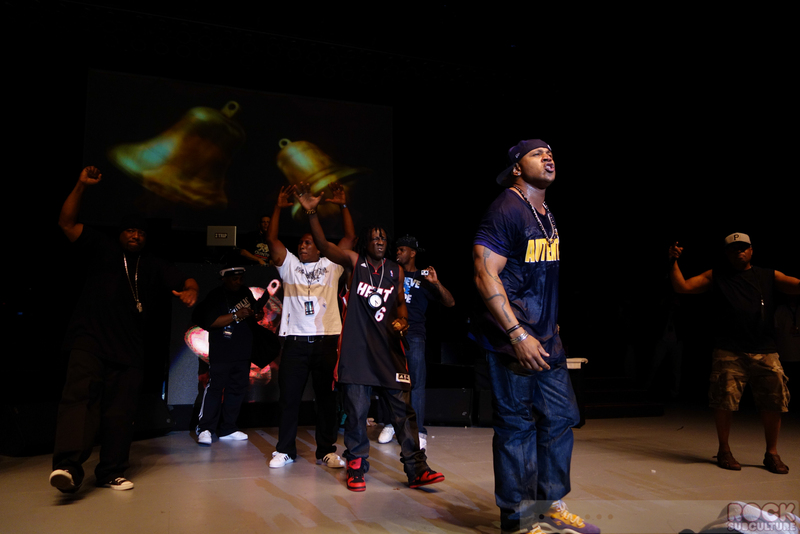 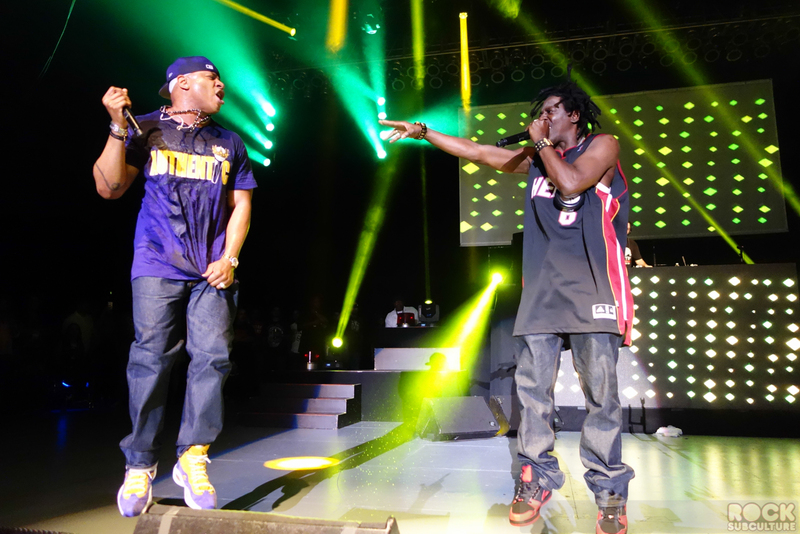 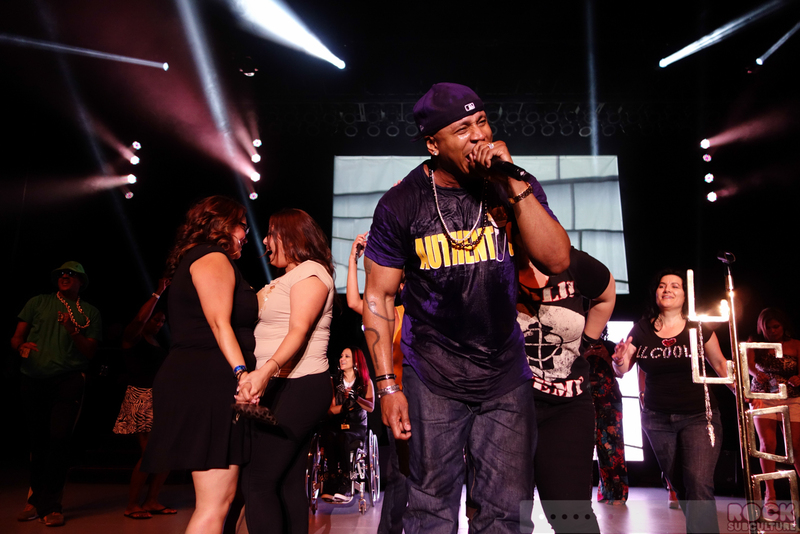 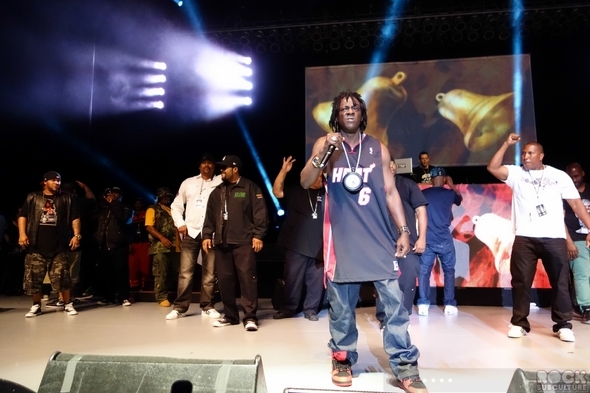 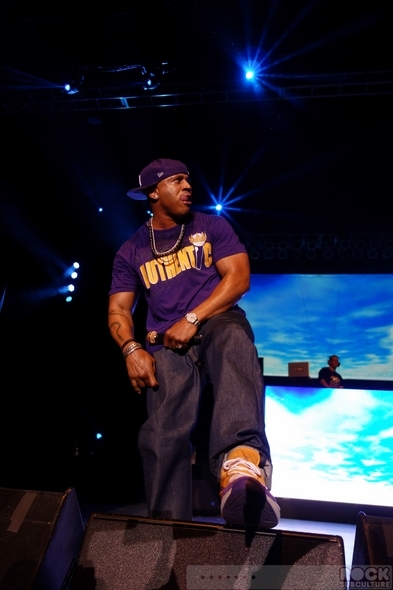 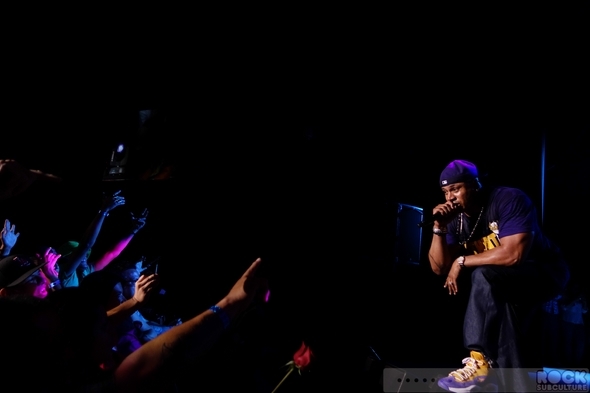 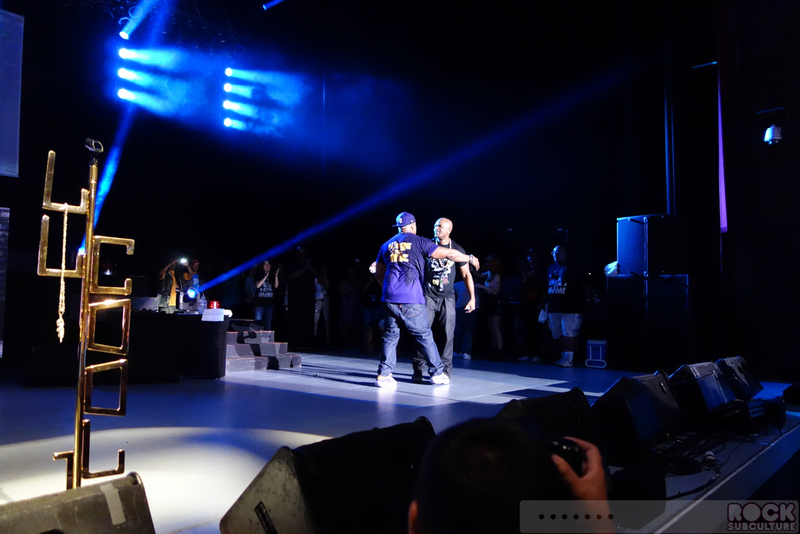 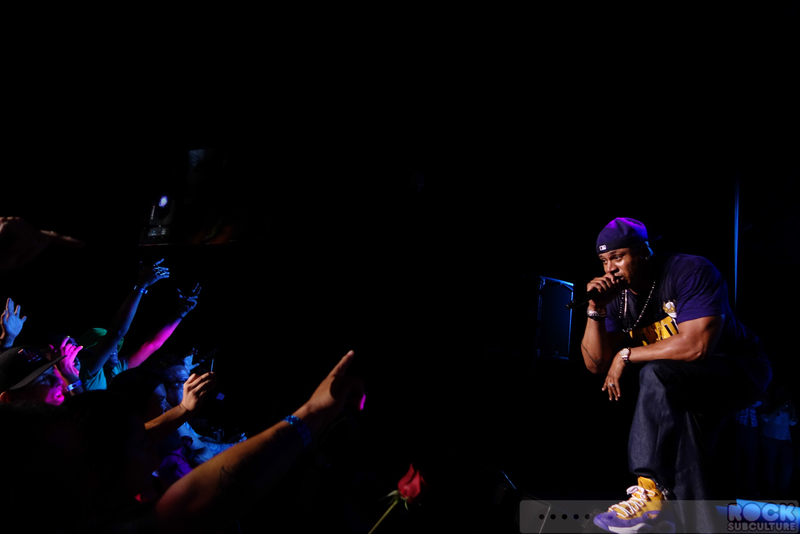 As the night was a celebration of hip hop, LL took the opportunity of others being on hand to bring them out on stage with him, doing a duo with both Chuck D and Flavor Flav at different points in his set. 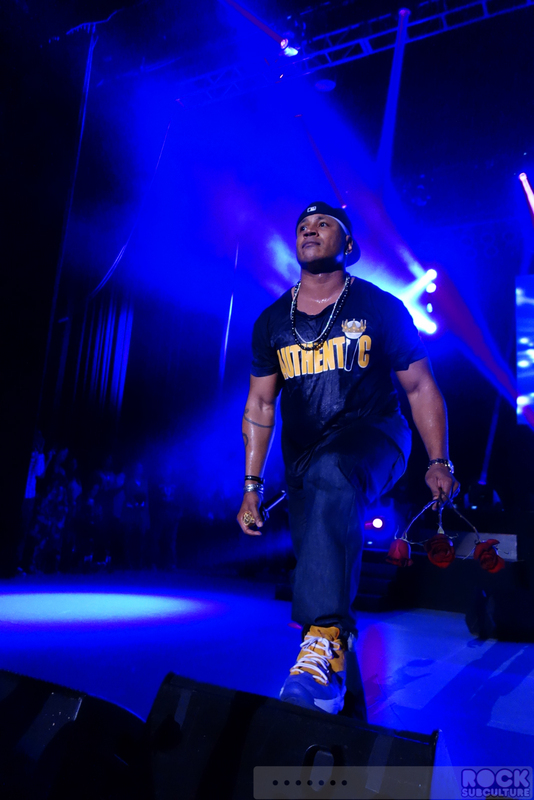 Like Ice Cube, LL Cool J seemed to have endless energy, using every inch of the wide and deep stage and running up and down the ledge of the platform to interact with fans up front. 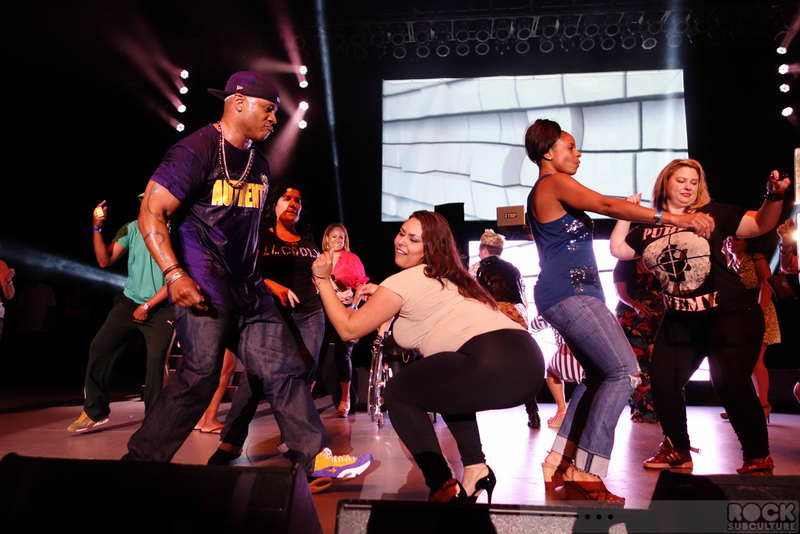 Later in the show, he even brought at least 20 fans on stage to dance with him. 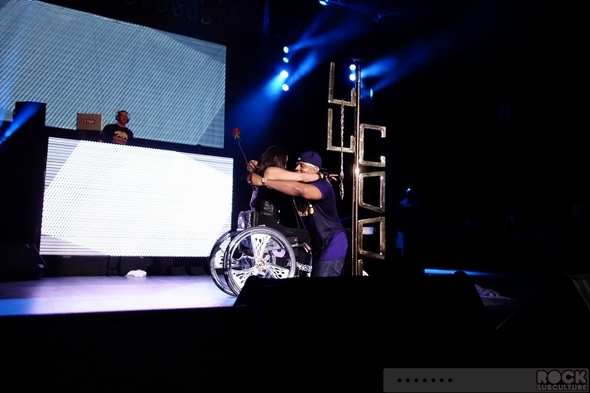 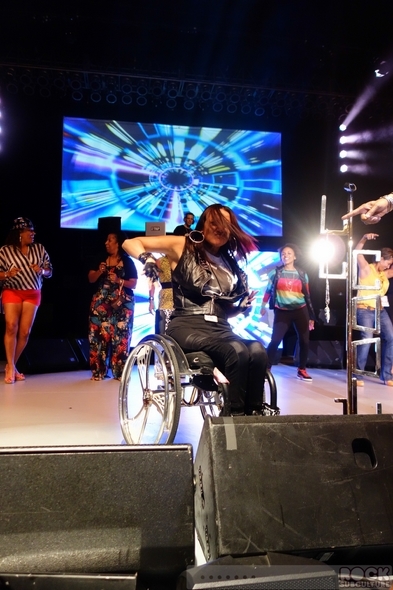 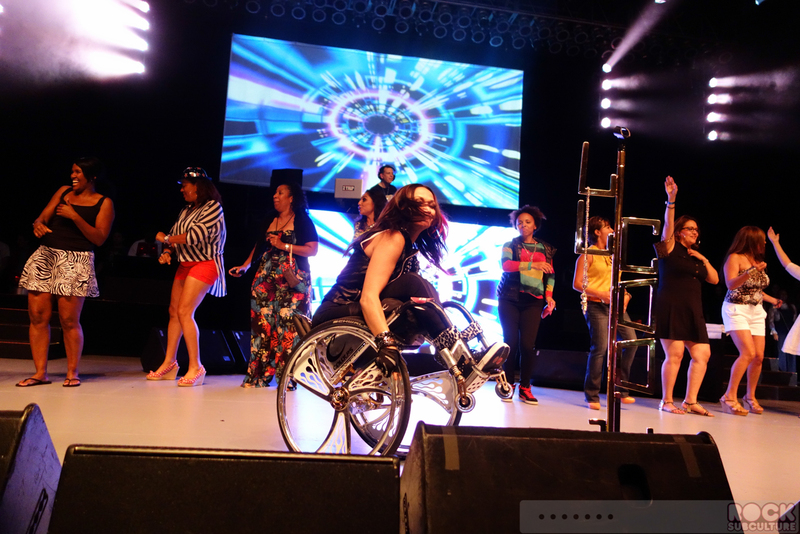 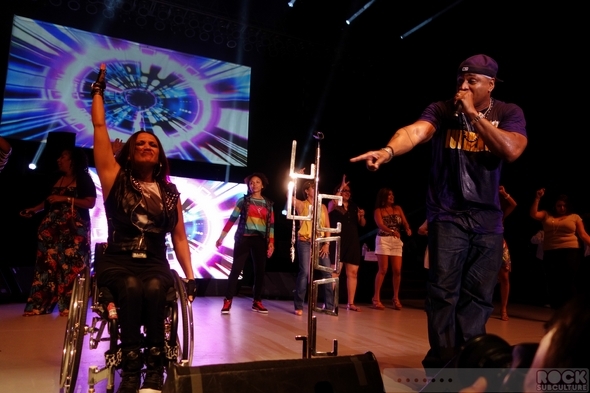 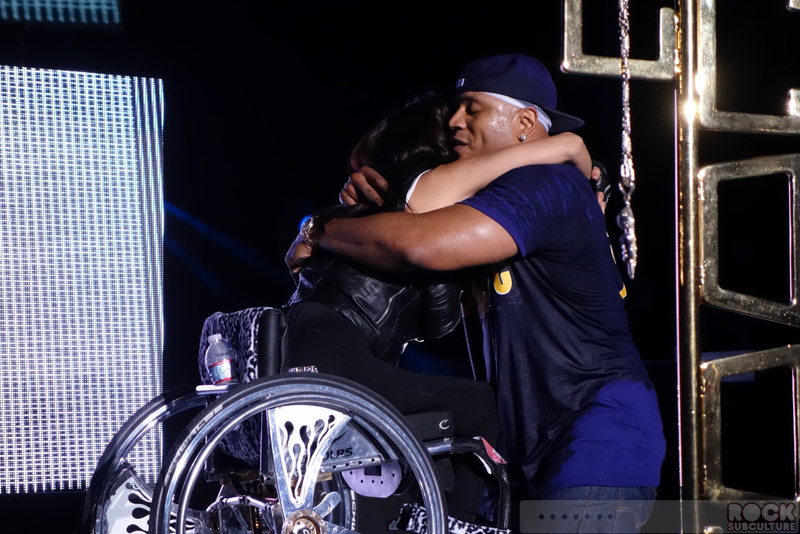 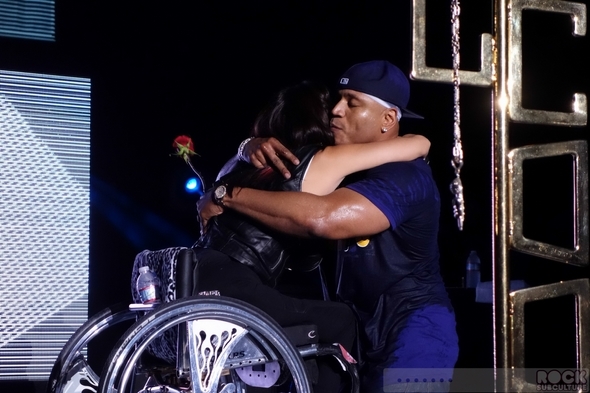 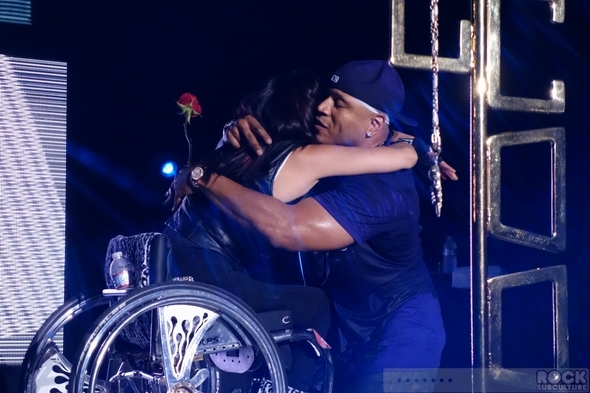 The most touching moment of the night was when LL brought one of his former dancers on stage in a wheelchair to show her some love and tribute. 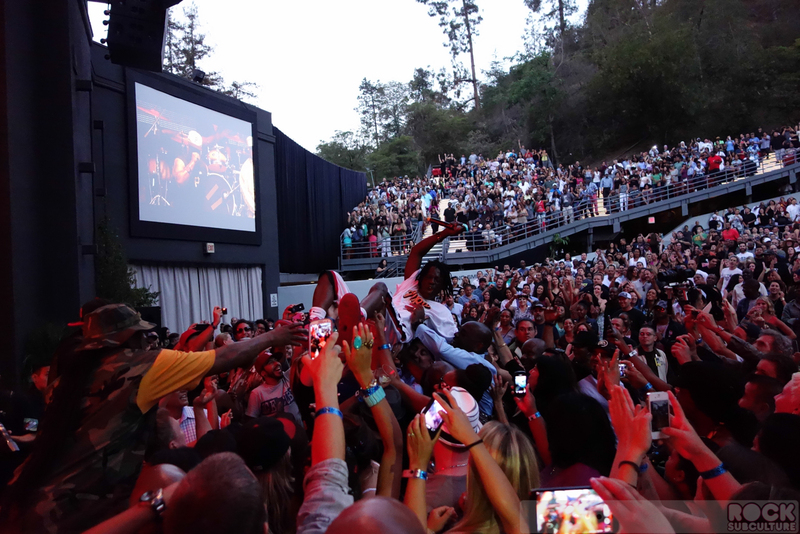 The entire show was like one long party with friends, and a celebration of music among innovators in that genre.